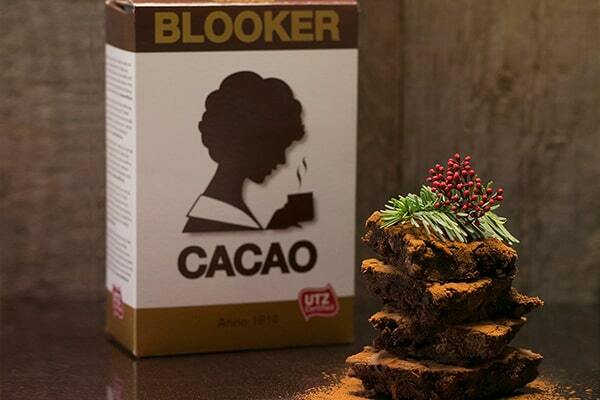 Blooker is deliciously soft cocoa powder in a beautiful authentic packaging. 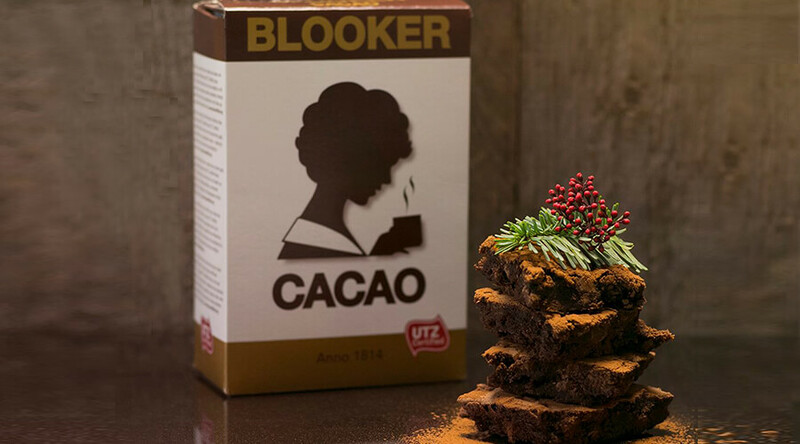 It can be used, among other things, for making chocolate milk, cupcakes or cakes and as a garnish on desserts or cappuccino. 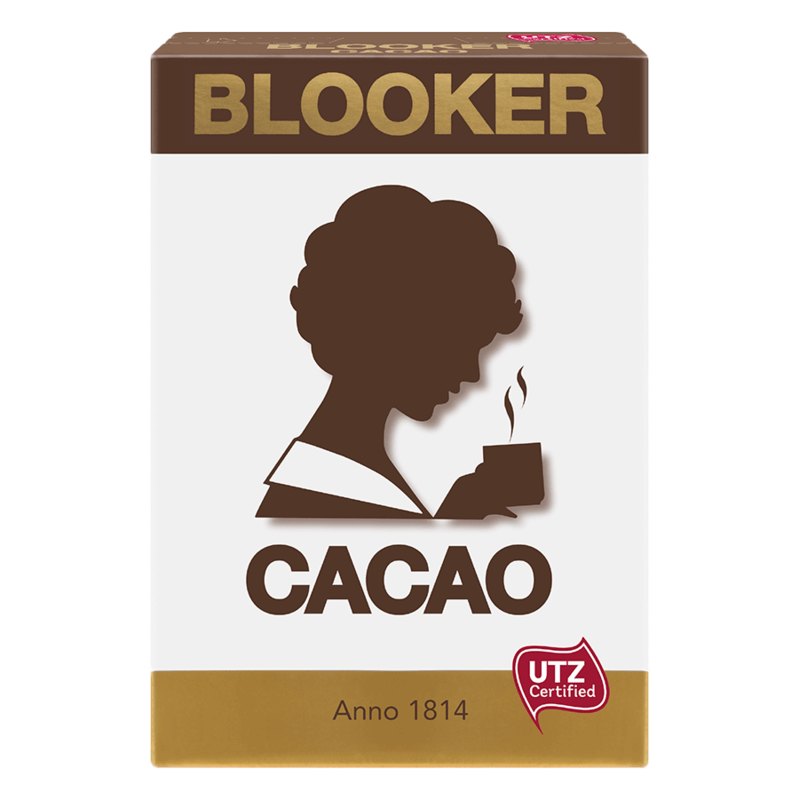 Blooker is available in one package (250g) and one flavor. 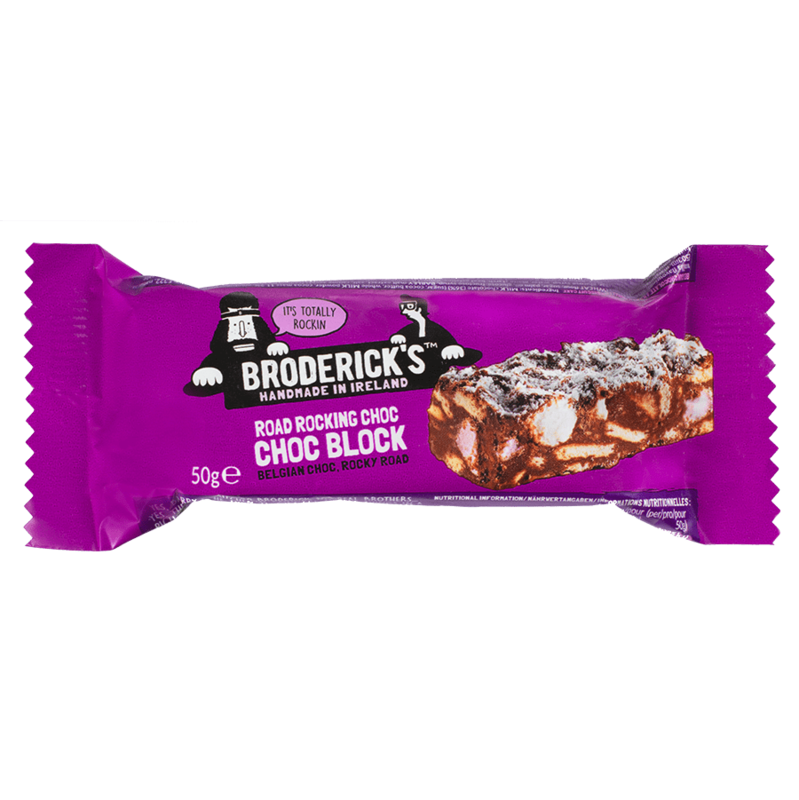 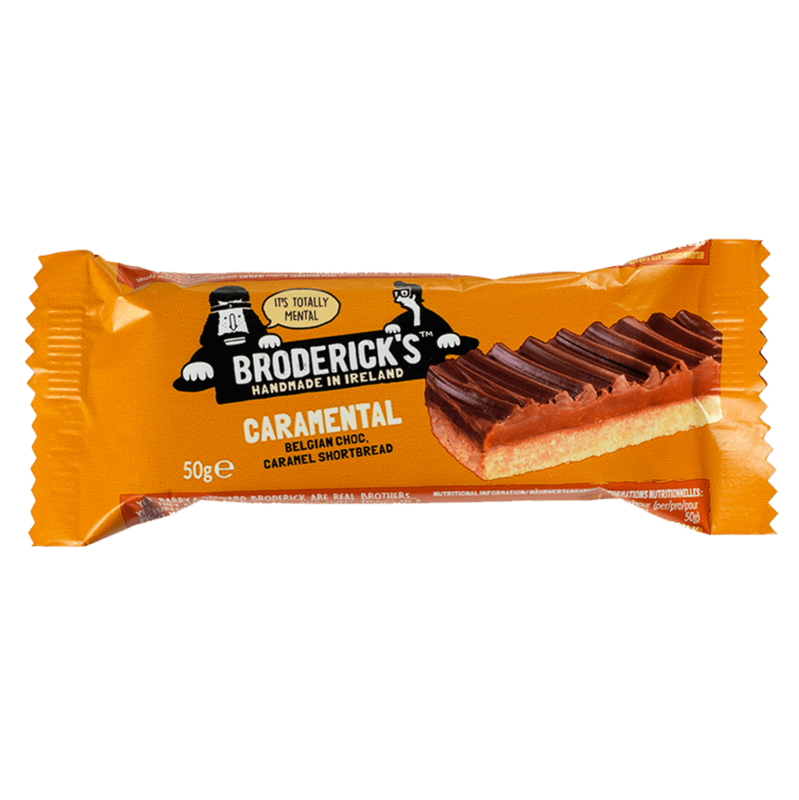 The makers of the delicious handmade Broderick's cookie bars are Barry Broderick and Bernard Broderick, two brothers from Dublin. 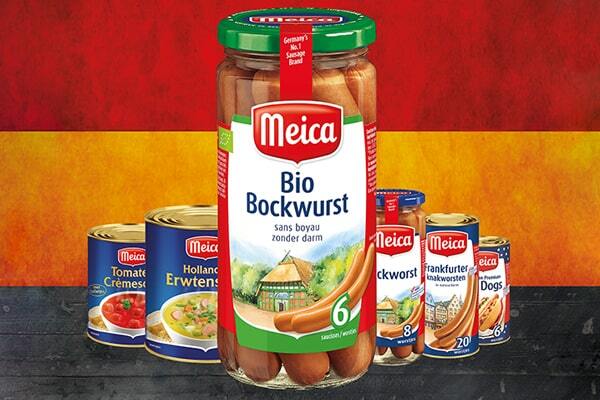 A real family business in heart and soul. 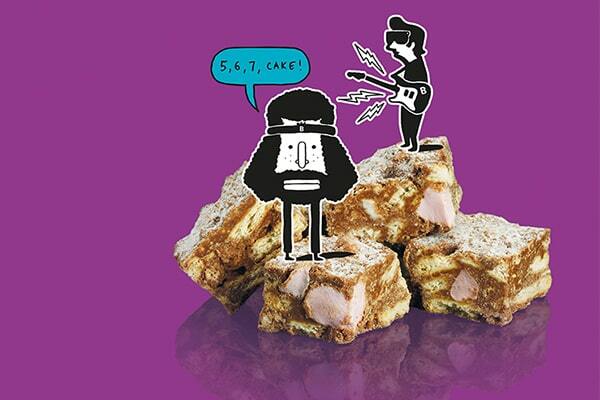 In the kitchen of mother Ina the brothers have learned how to bake. They have been making delicious home-made chocolate cake with chocolate, handmade cookie bars for years. 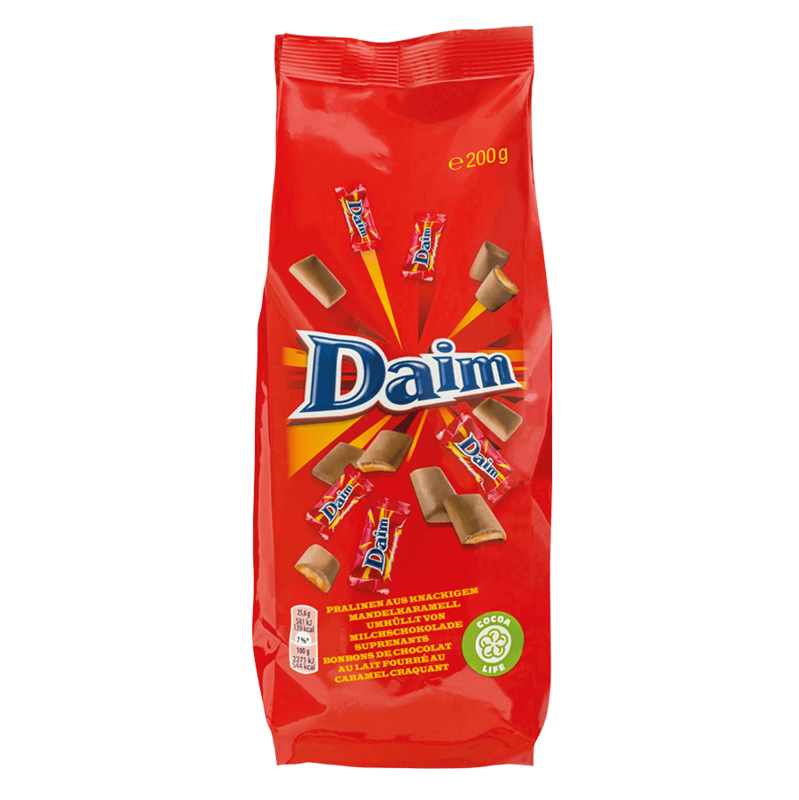 Daim is a Swedish product that differs from other chocolate products by a surprisingly crunchy core of almond and caramel wrapped in soft milk chocolate. 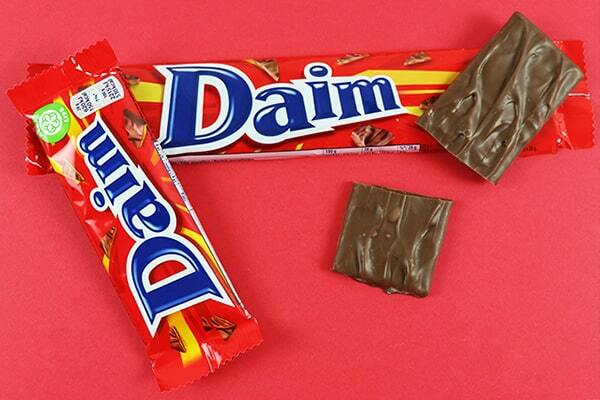 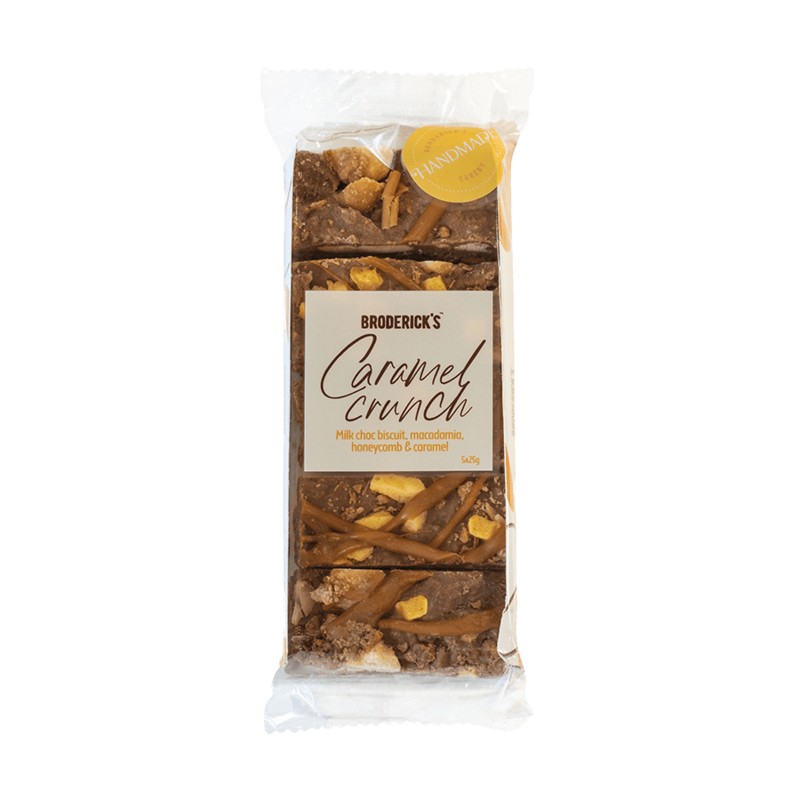 Because of this core Daim has a tasty and firm bite and is the ideal combination of chocolate and candy. 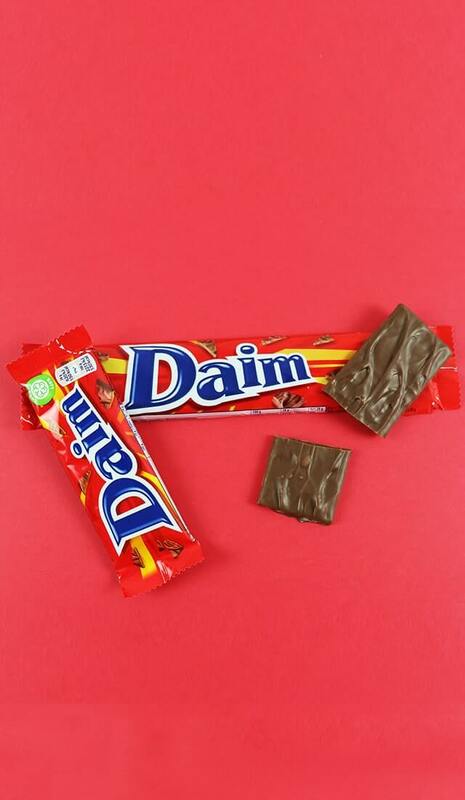 The original name of the sweets introduced in 1953 in Sweden and Norway is Dajm. 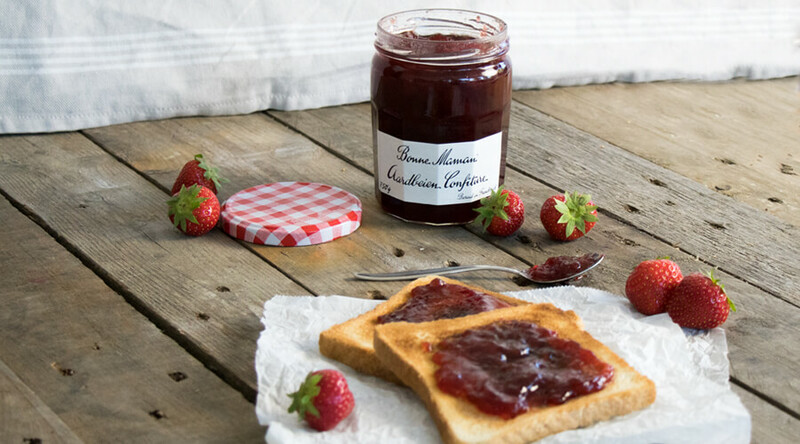 Today it is exported to countries around the world. 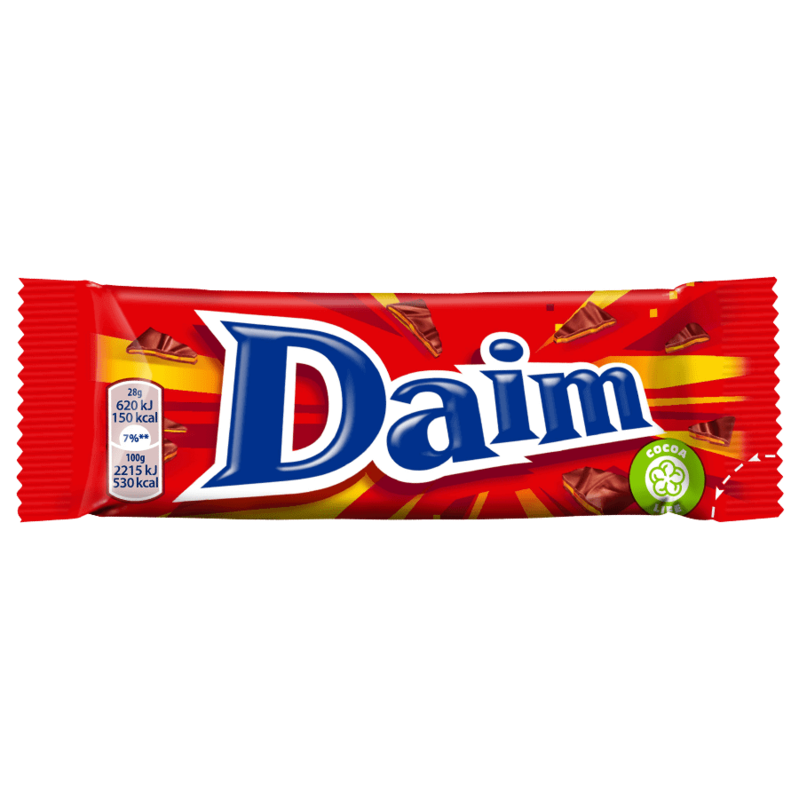 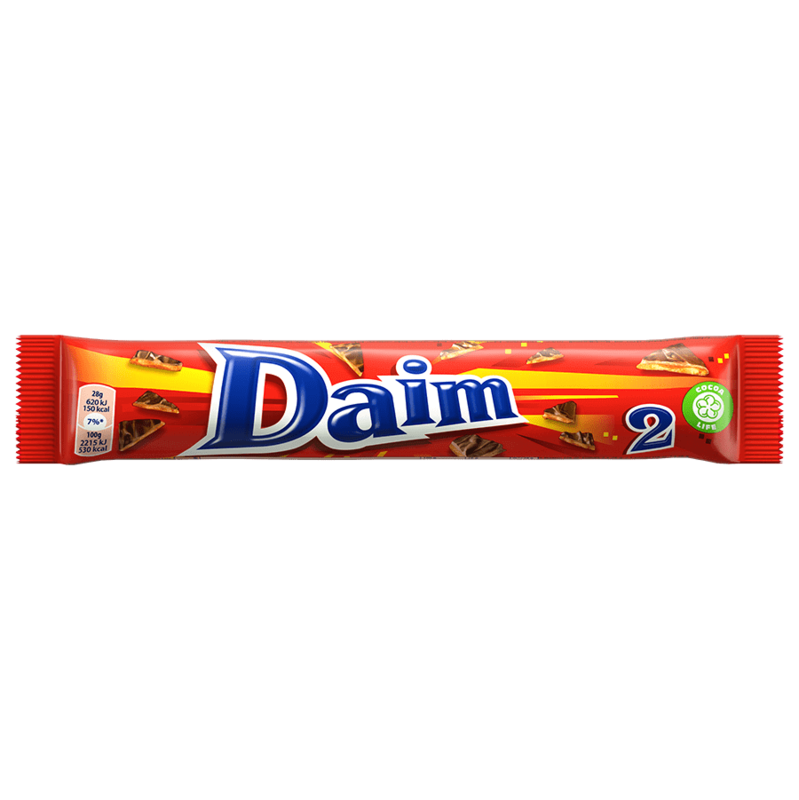 Daim is available in a bar of 28g and 56g and mini's in a bag of 200g. 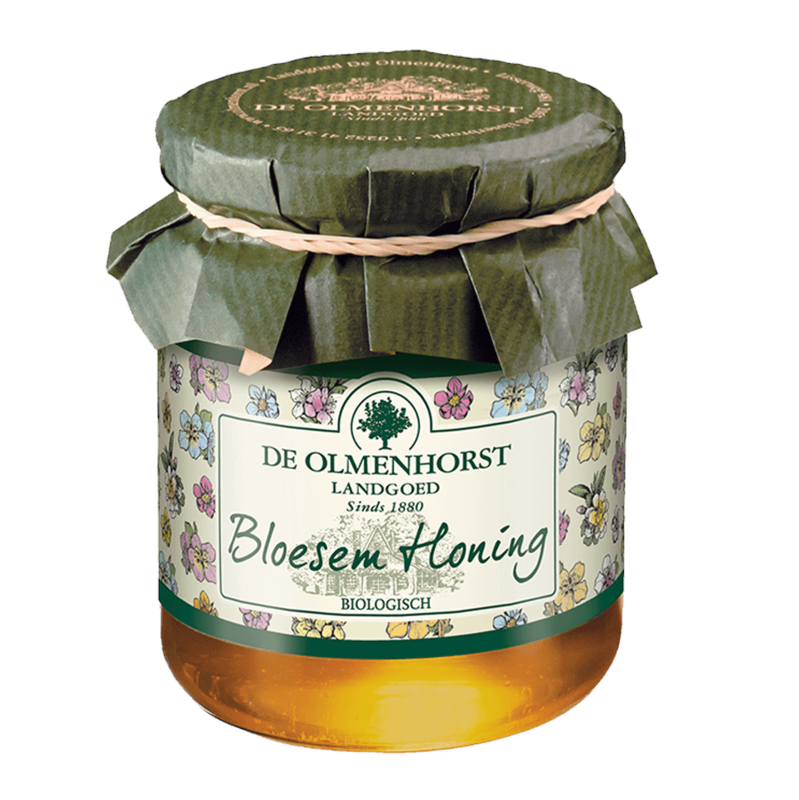 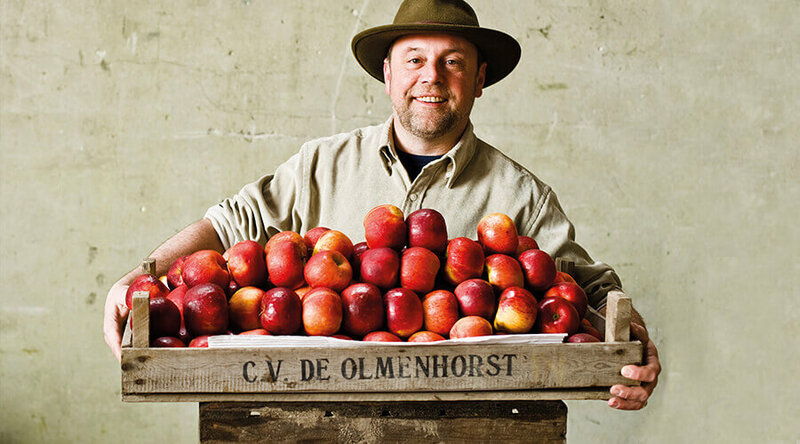 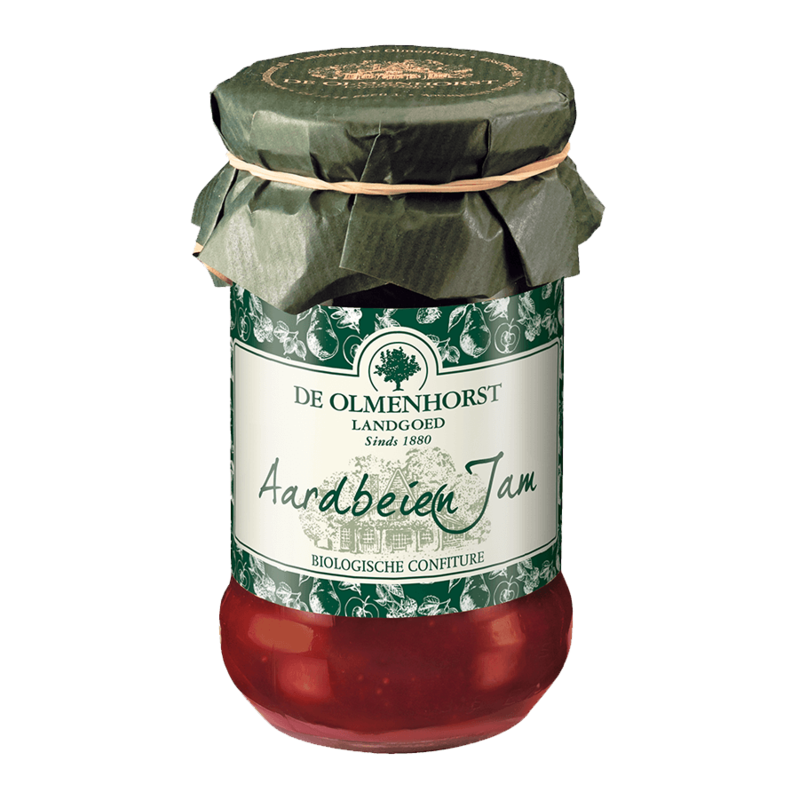 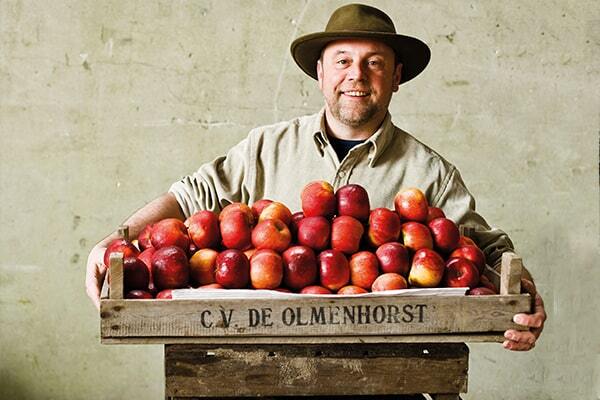 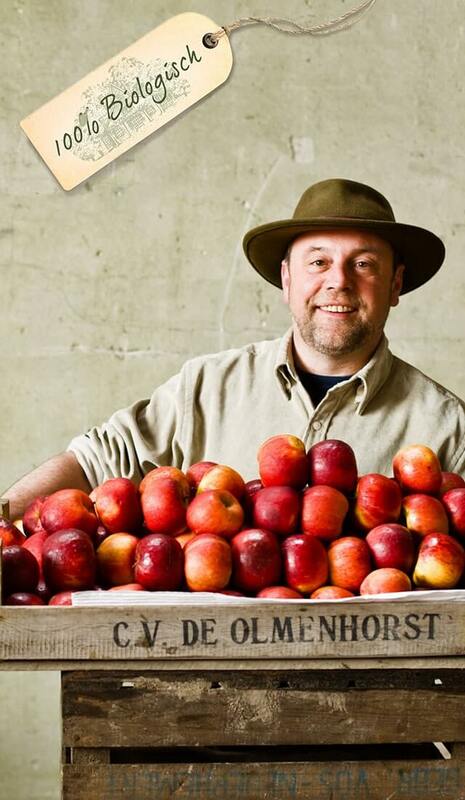 De Olmenhorst is available in three packages (340g, 300g, 325g) and 4 flavors. 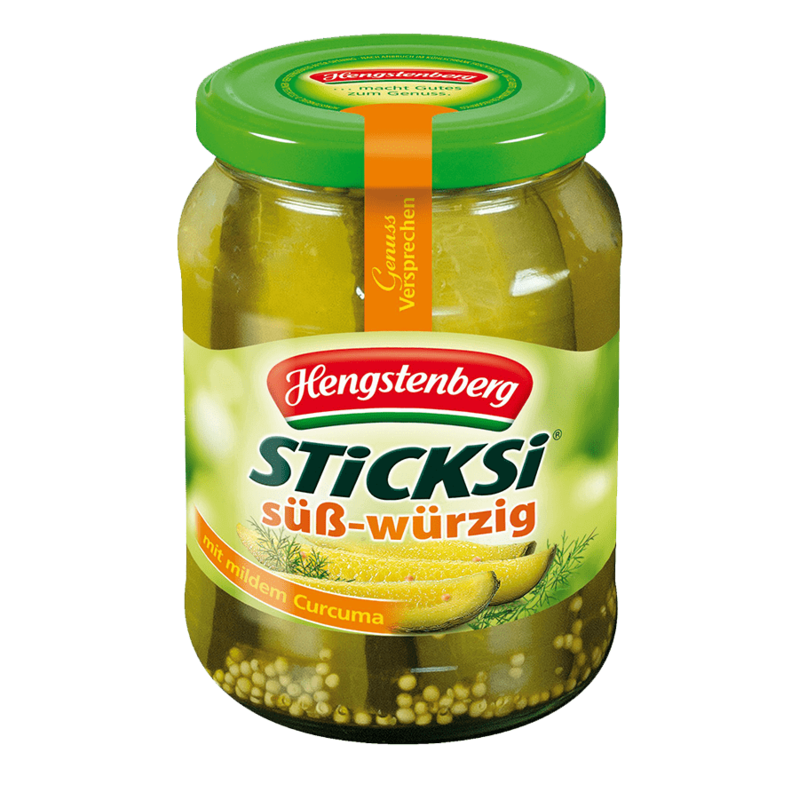 Sticksi pickles (720ml) are full of flavor, deliciously juicy and crunchy fresh. 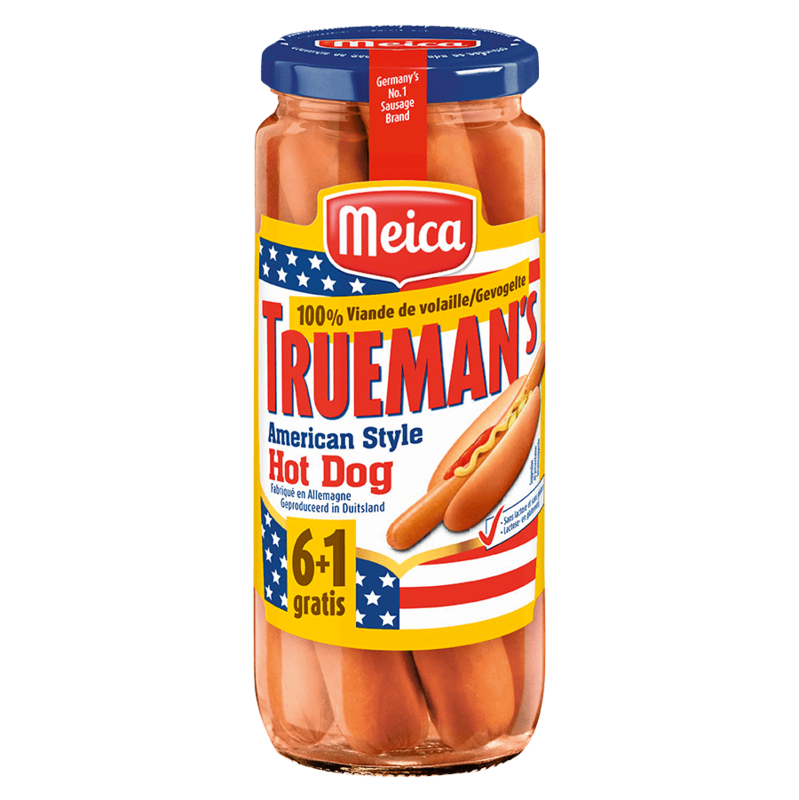 They are carefully seasoned sweet-sour with, among other things, turmeric. 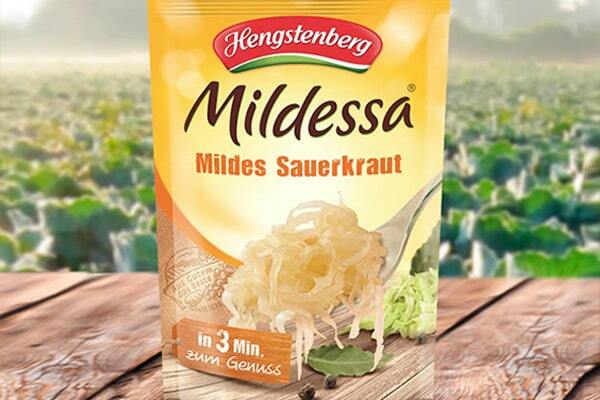 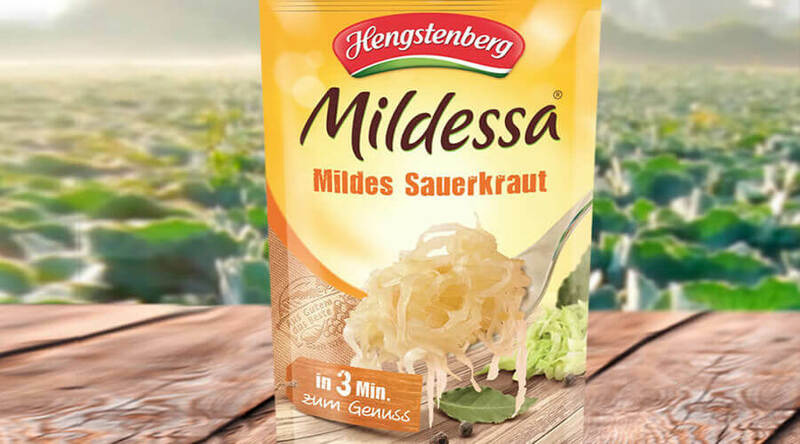 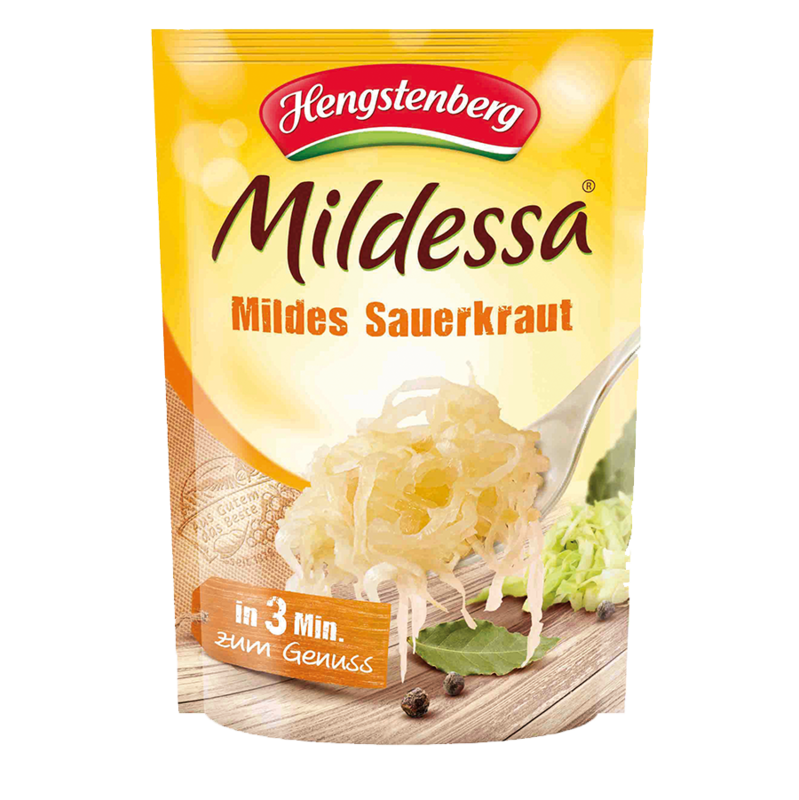 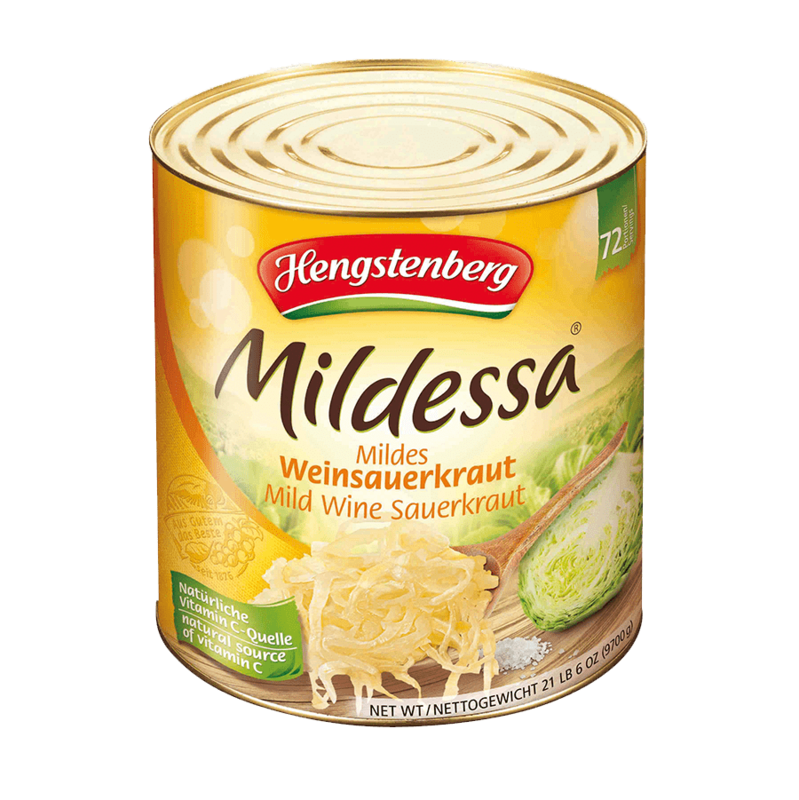 Mildessa sauerkraut is a mild sauerkraut with a deliciously soft taste. 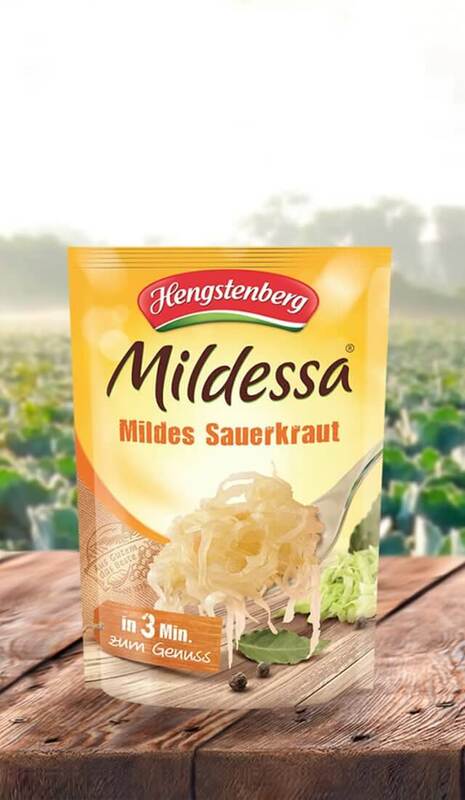 The sauerkraut is finely cut, low in calories and healthy: sauerkraut contains a lot of vitamin C! 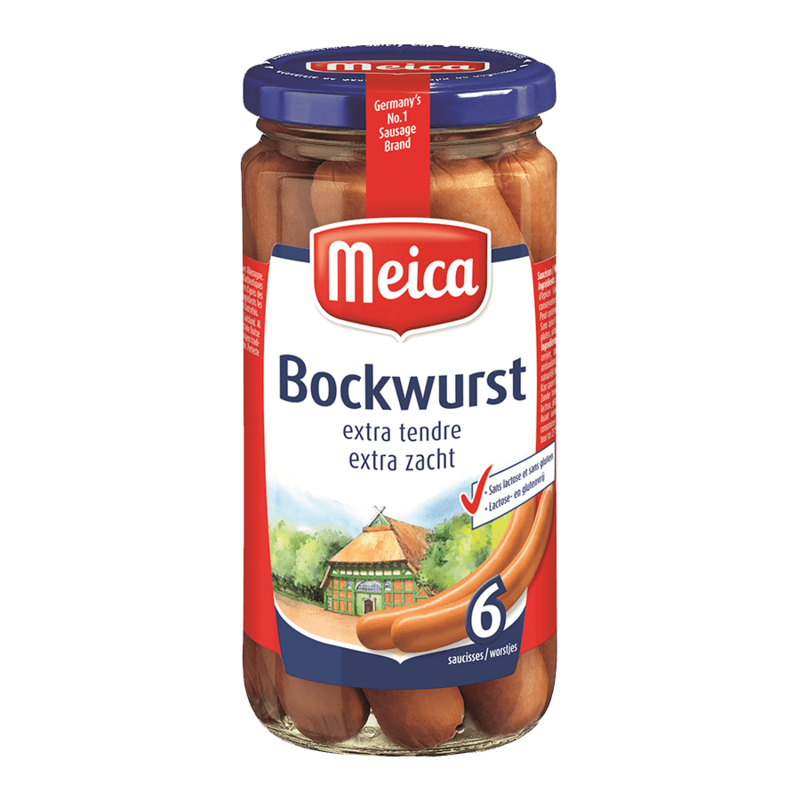 Available in a large package tin of 10,2L, 550g sauerkraut and a small package of 400g. 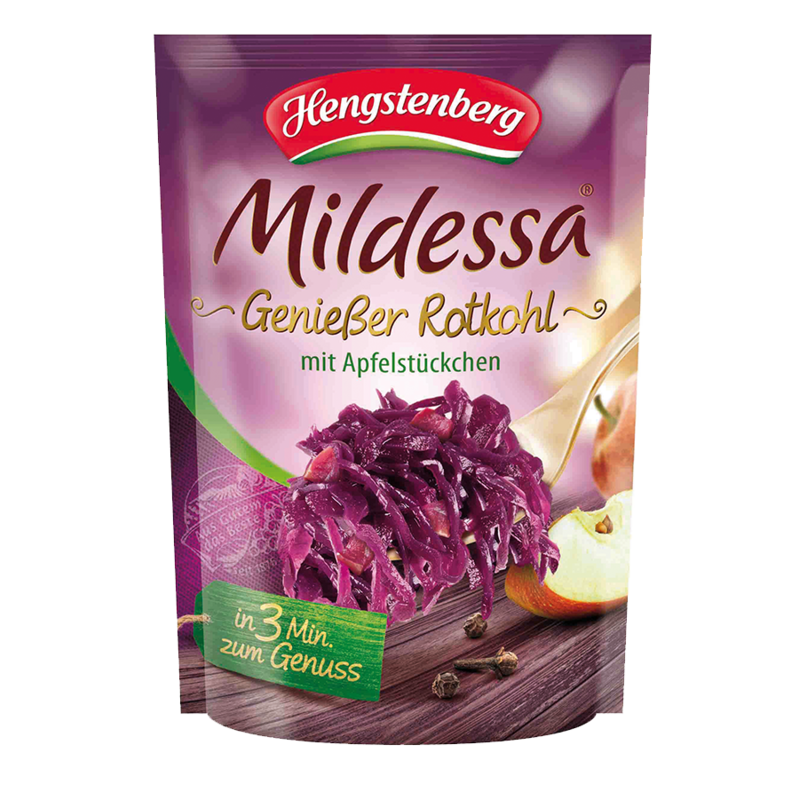 Red cabbage with apple is available in a pack of 400g. 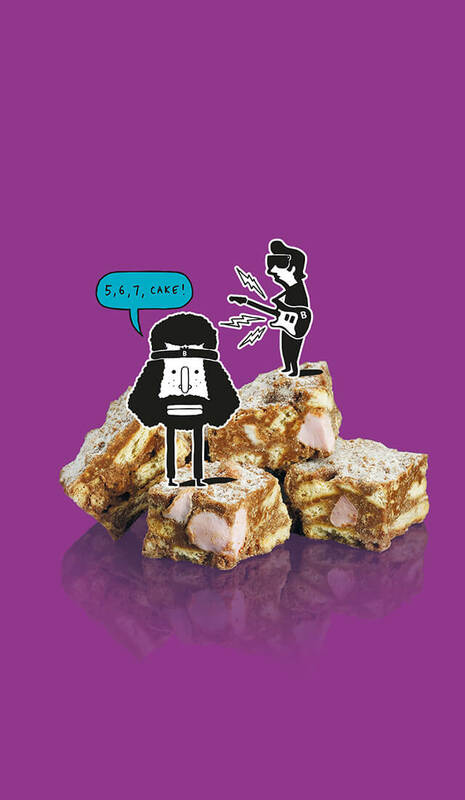 There are things that you can always enjoy. 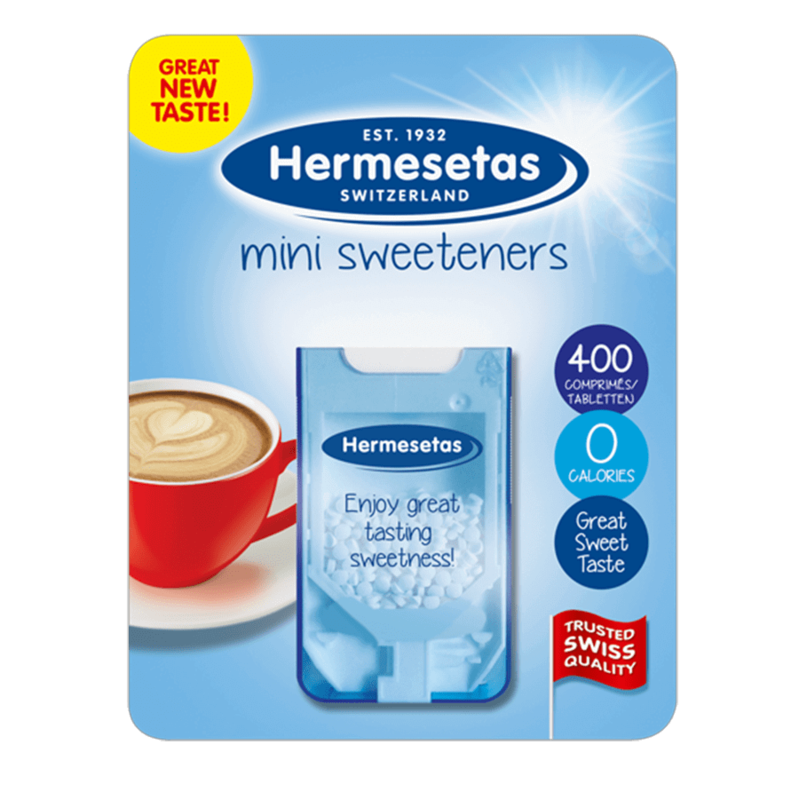 A nice cup of coffee or tea with the sweets from Hermesetas for example!! 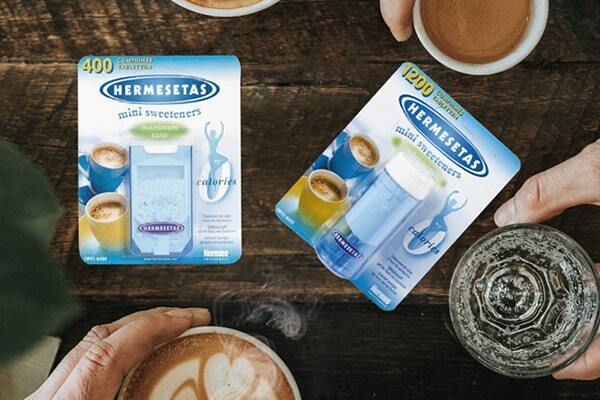 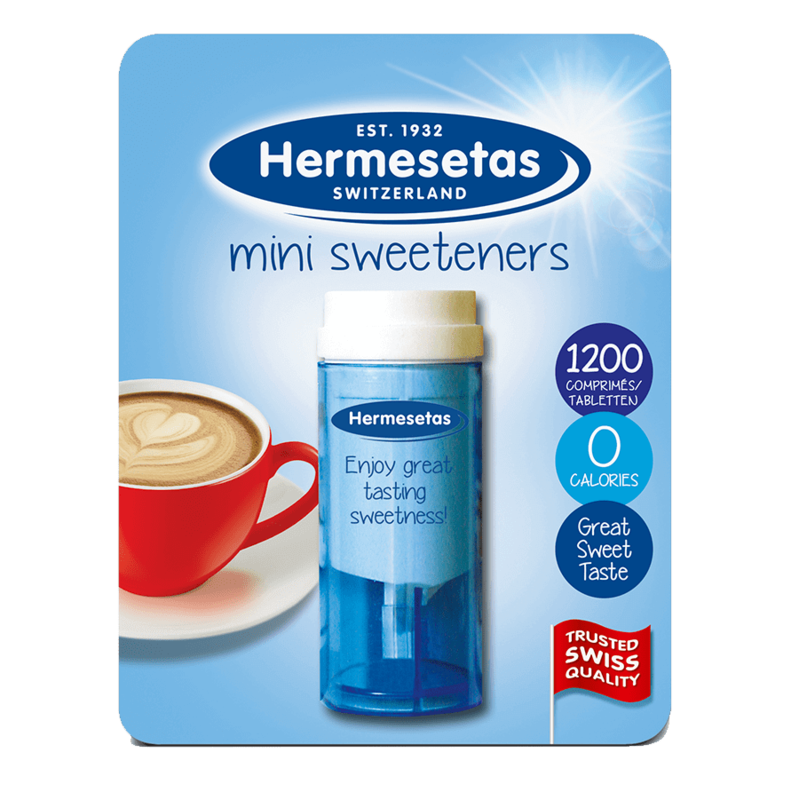 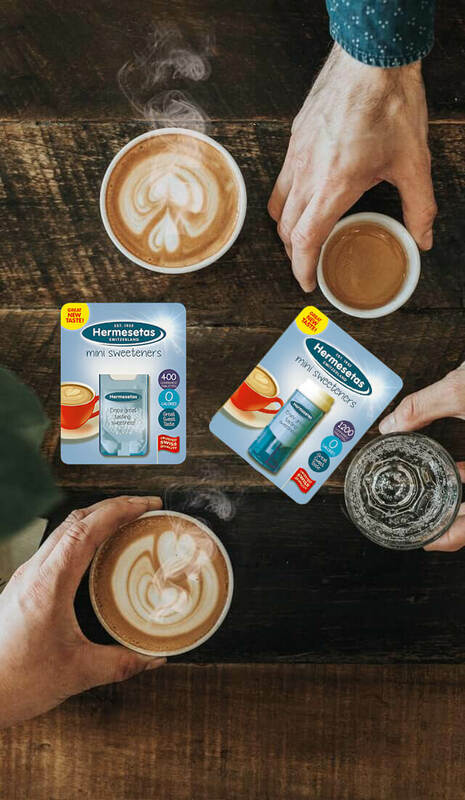 The sweets from Hermesetas are made on the basis of the sweetener saccharin and available in dispensers of 400 and 1200 pieces. 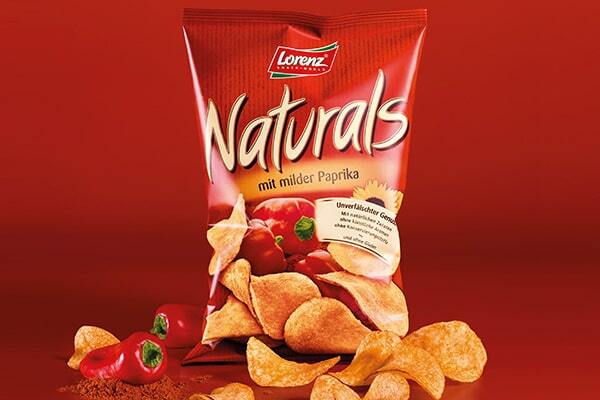 Lorenz exists since 1935 and is a real family business! 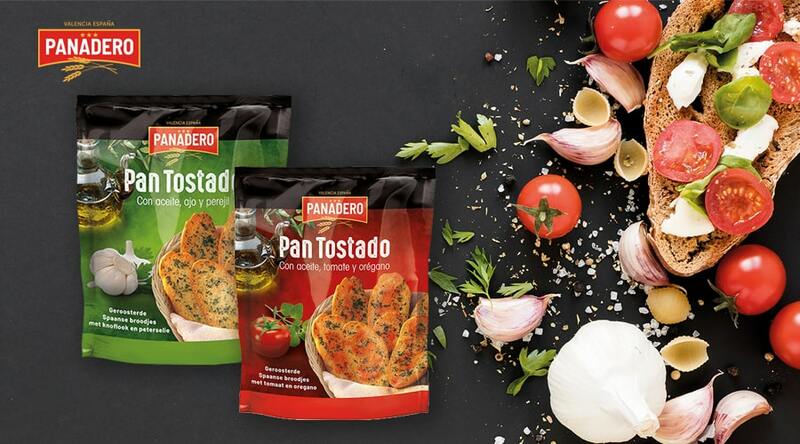 They produce snack products for the whole family and offer a wide range of chips and salty snacks. 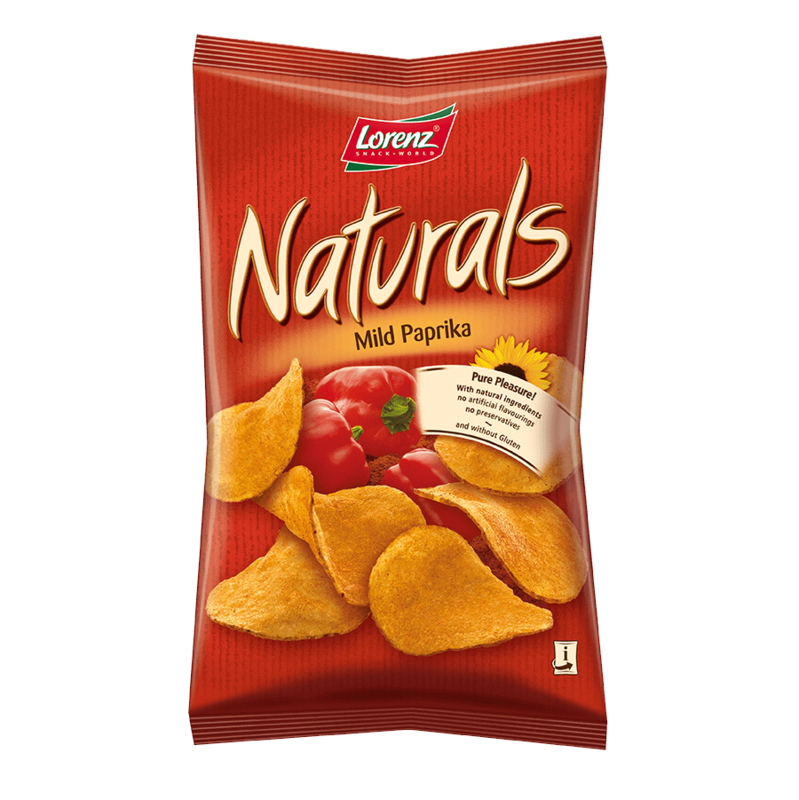 Naturals chips are gluten-free and available in the flavors Paprika (100g). 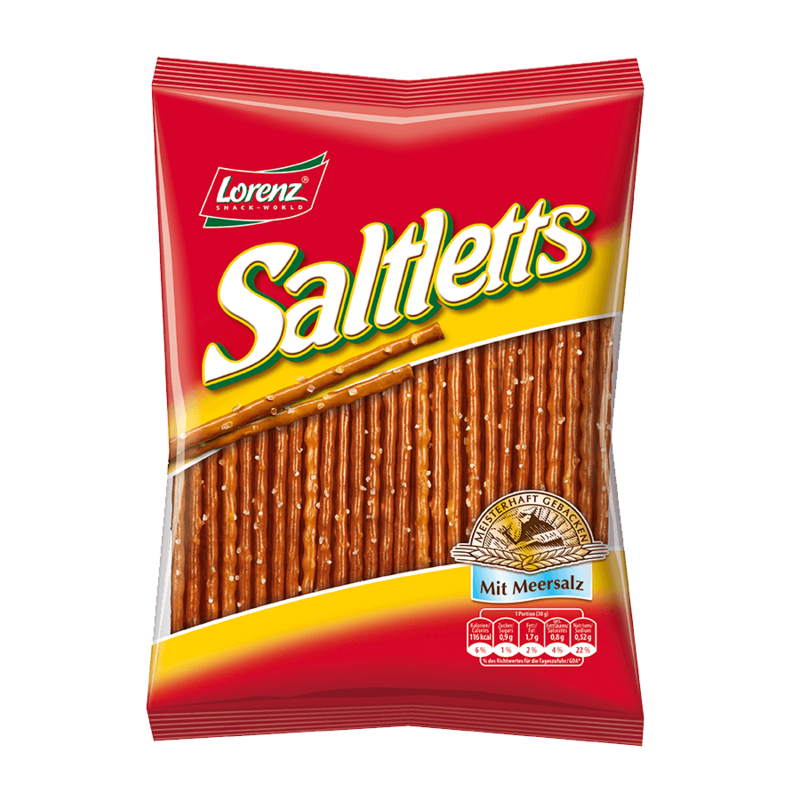 Saltletts are salty snacks made according to traditional recipe sprinkled with fine sea salt (150g). 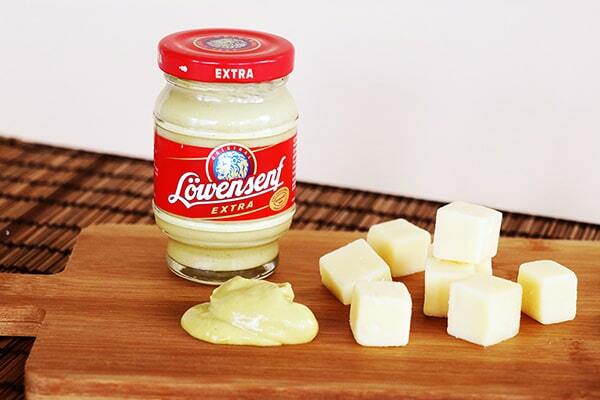 For more than 75 years, Löwensenf has been a classic among mustard. 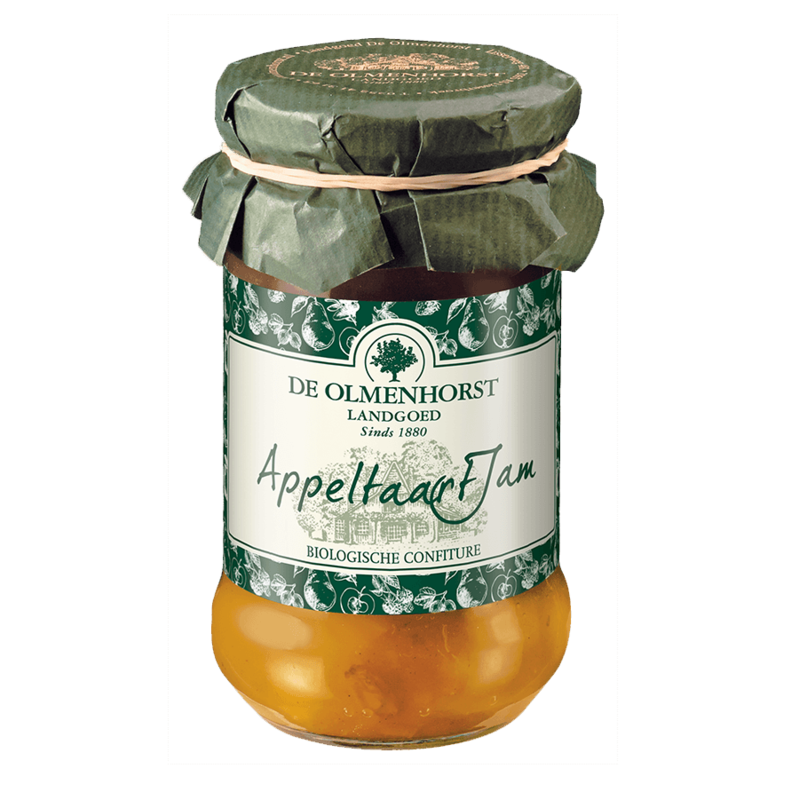 Löwensenf is known and loved for its unique spicy and sharp taste. 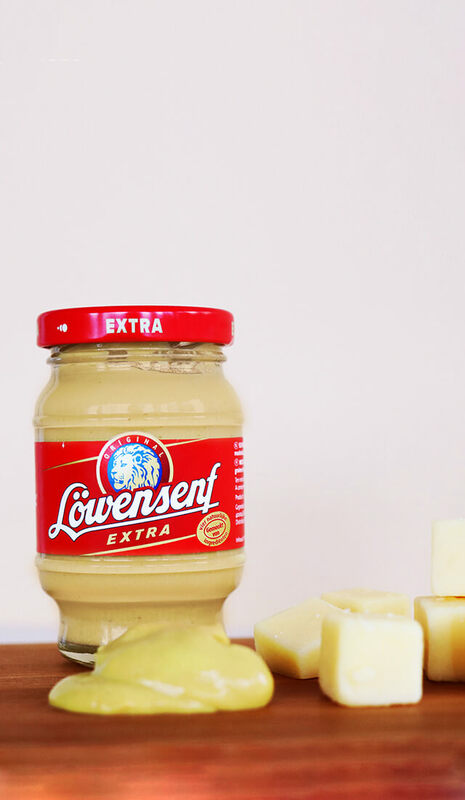 Löwensenf remains true to its exceptional quality that meets the highest standards. 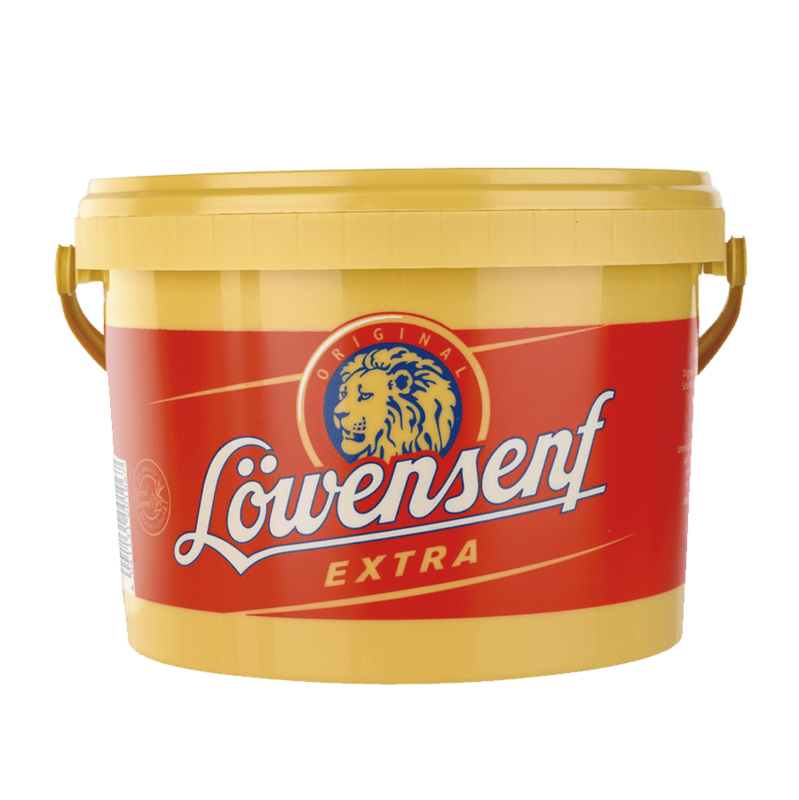 Löwensenf consists of freshly ground brown and black mustard seeds (Terra Leone), vinegar, water and salt. 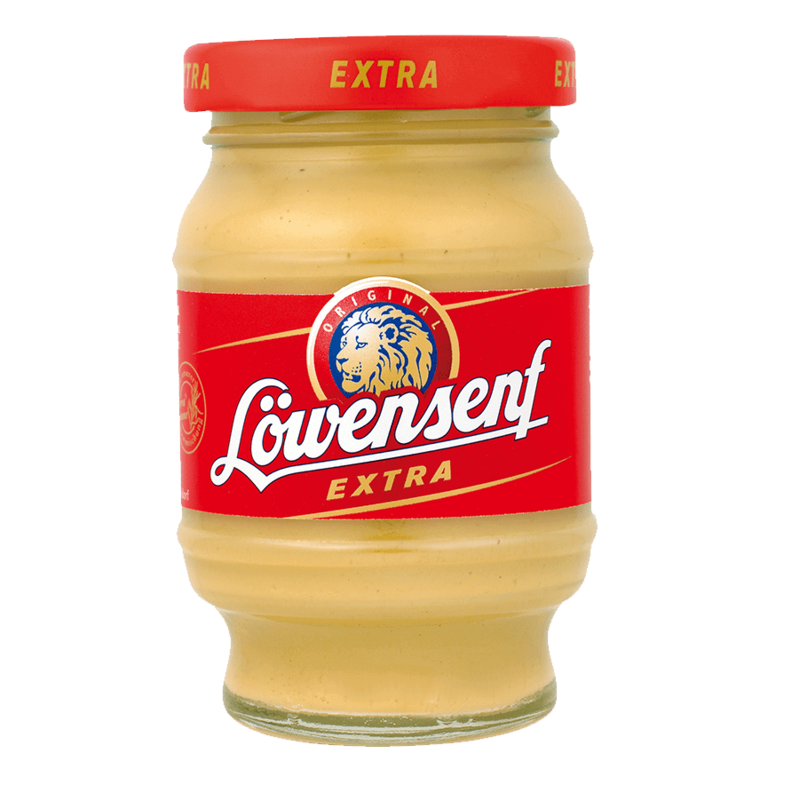 Löwensenf purity stands above everything, so this mustard does not contain any preservatives and therefore has a limited shelf life. 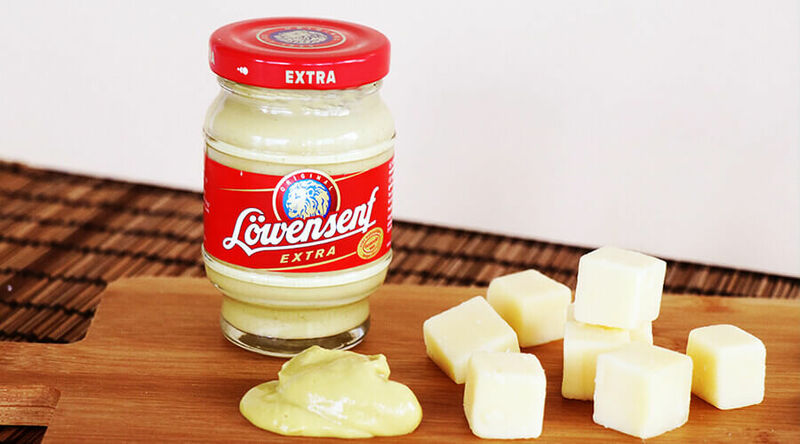 Löwensenf is available in three packages (100ml, 250ml, 2,5kg). 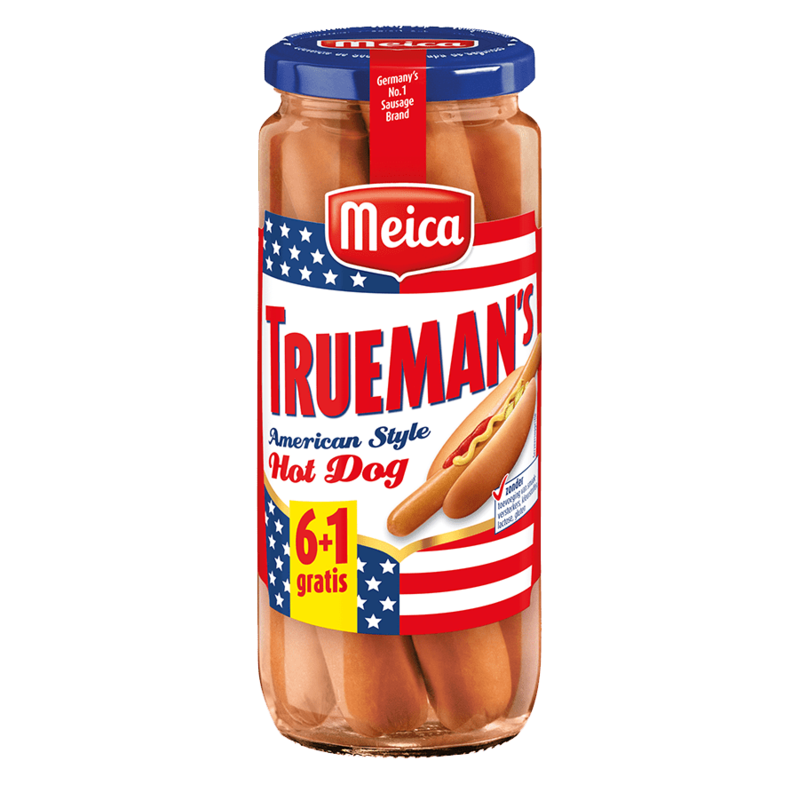 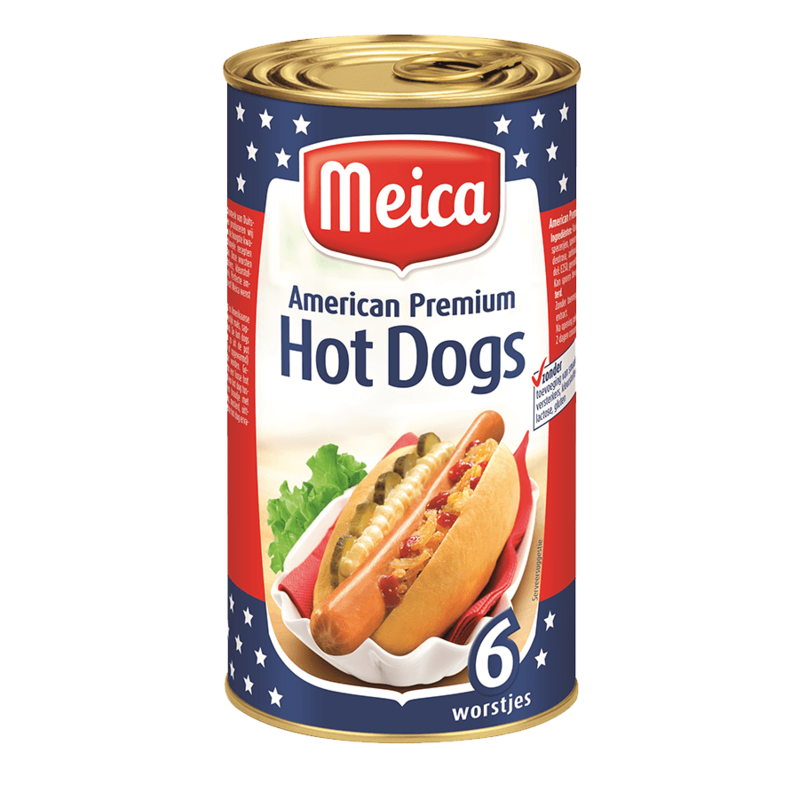 "Meica has been producing sausage specialties since 1908. 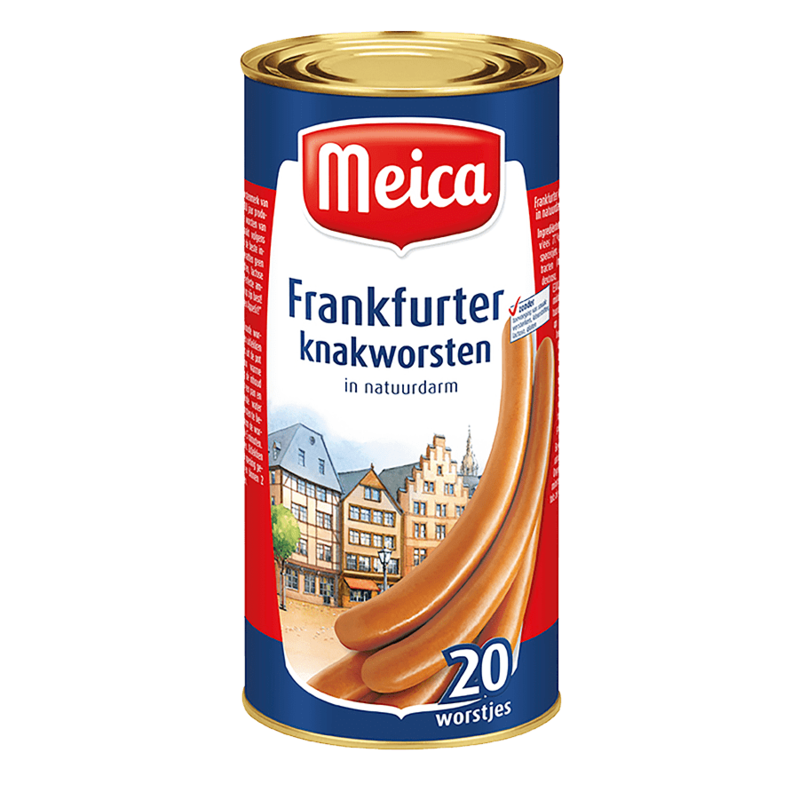 Still, all sausages are smoked over real beech wood and the ingredients are essential for the high quality. 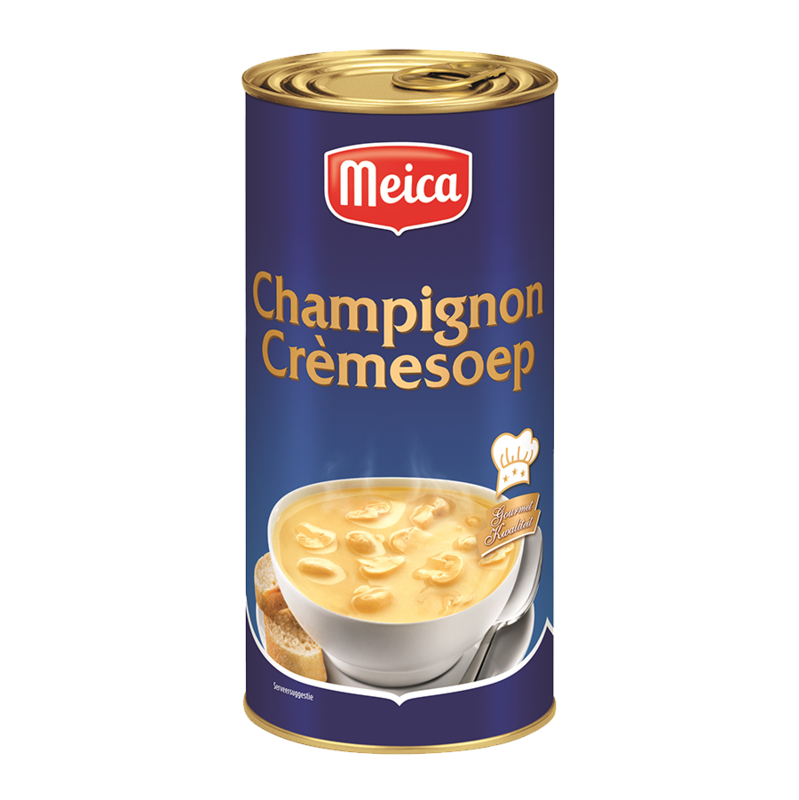 Besides a wide range of sausages, Meica also supplies various varieties of meal soups, richly filled with lots of fresh ingredients. 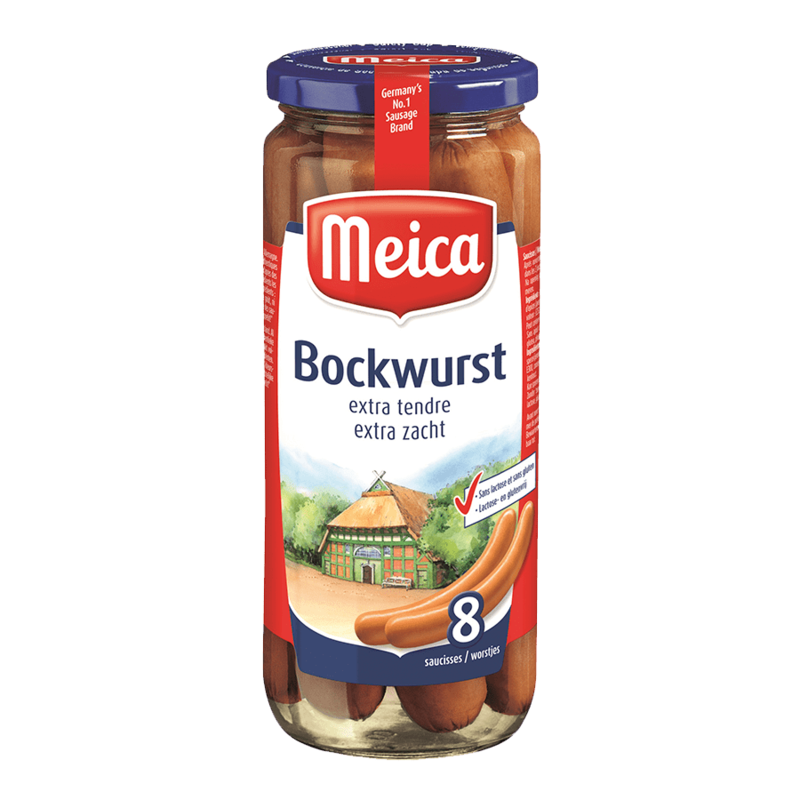 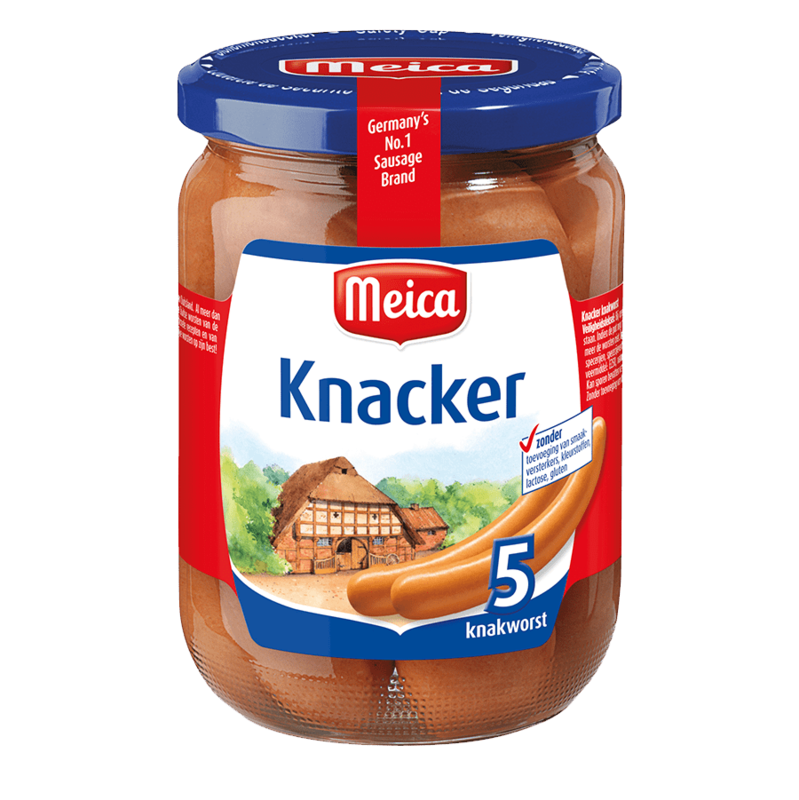 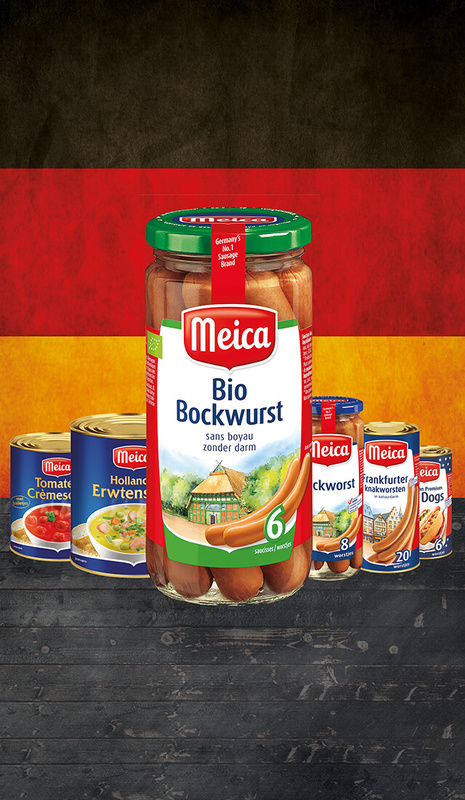 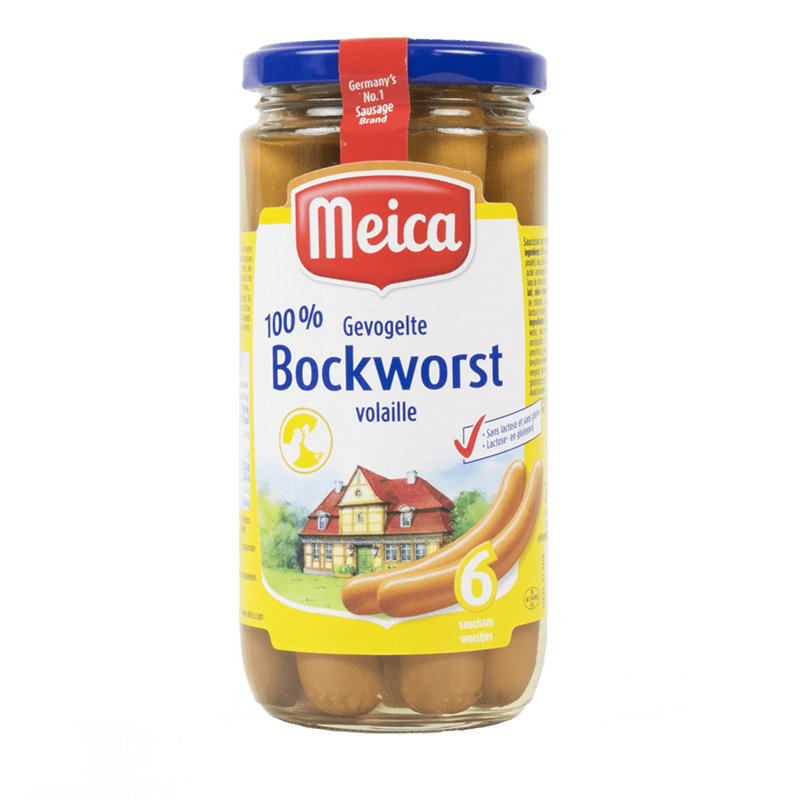 As a German specialist in sausage products Meica carries a wide selection of the tastiest sausages, such as spicy Bock sausages, organic sausages, aromatic Frankfurters and juicy Hot Dogs. 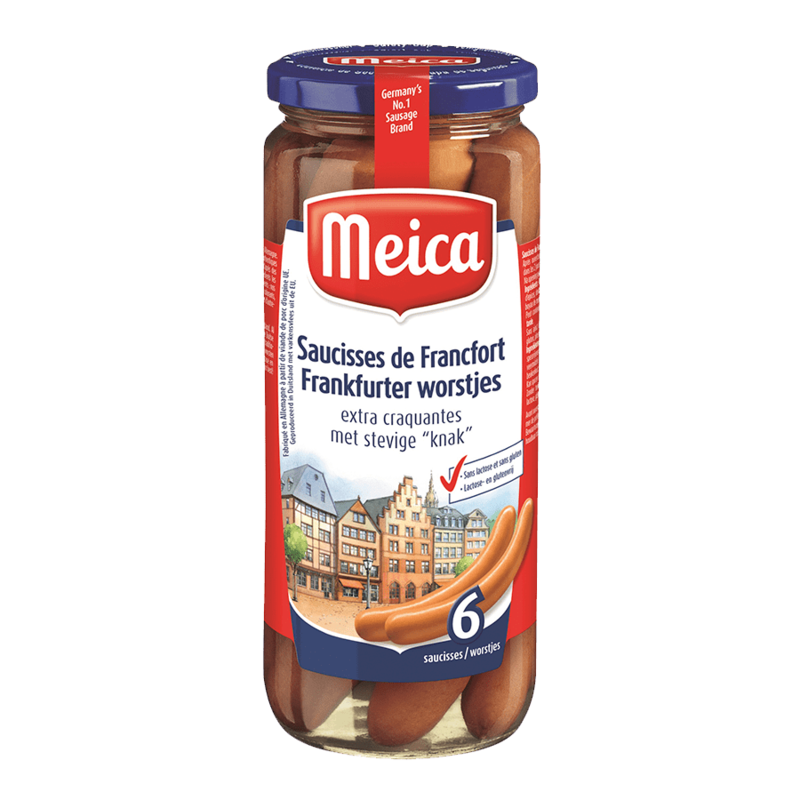 The Meica sausages are available in small and large packs of 180g to 1.650g. 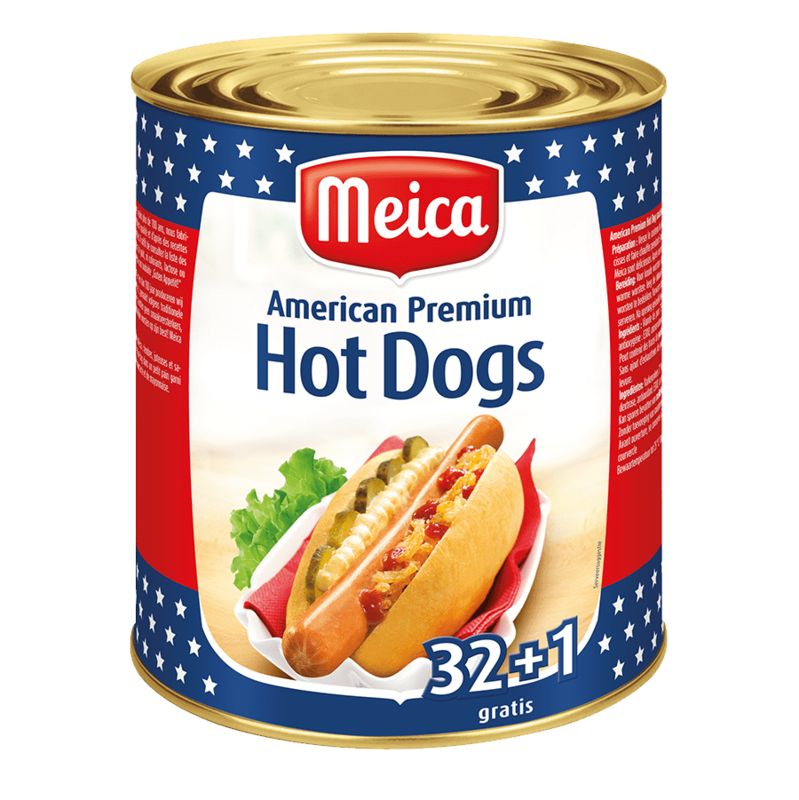 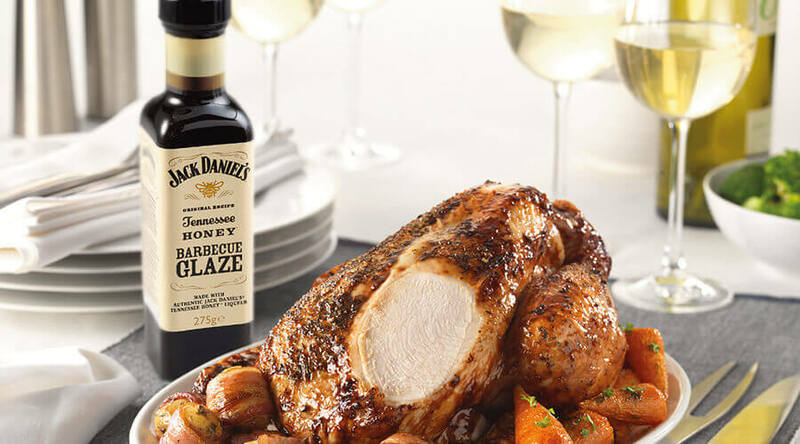 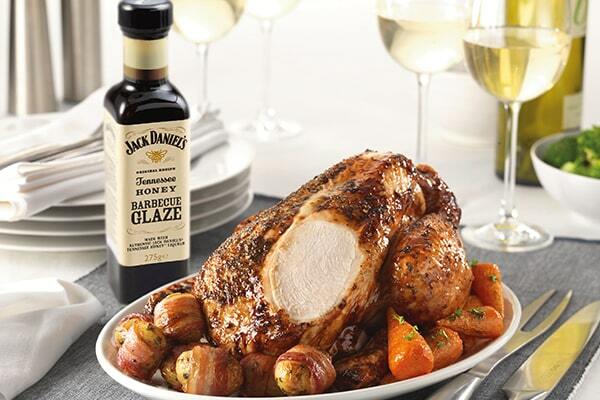 Meica uses only pure and fresh pork and does not contain colorings, flavorings or preservatives. 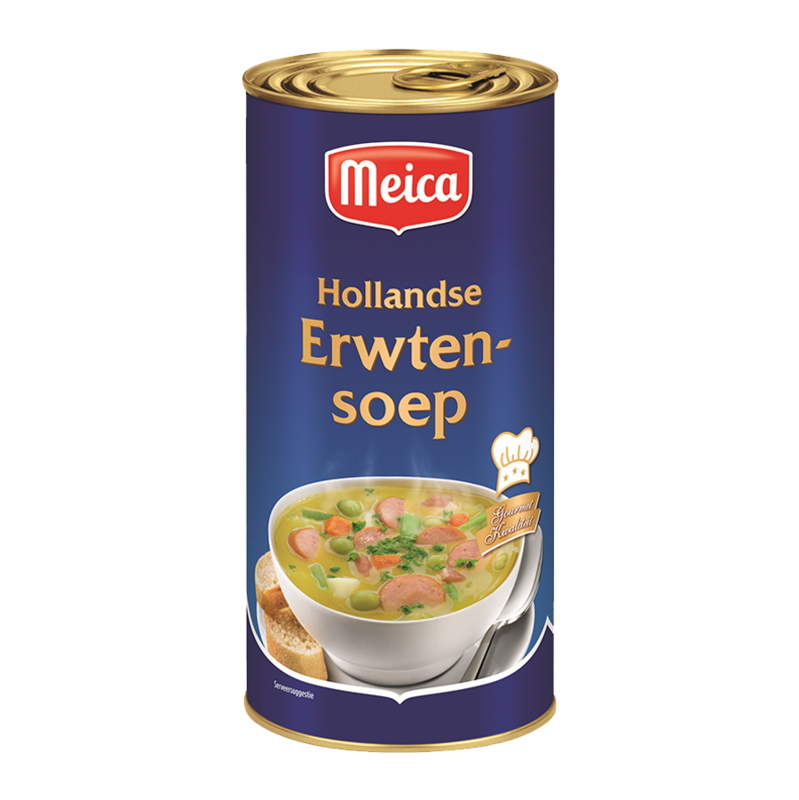 Meica soups are available in the flavors of Dutch pea soup, tomato soup, mushroom soup, goulash soup and chicken soup (1,6L and 3L). 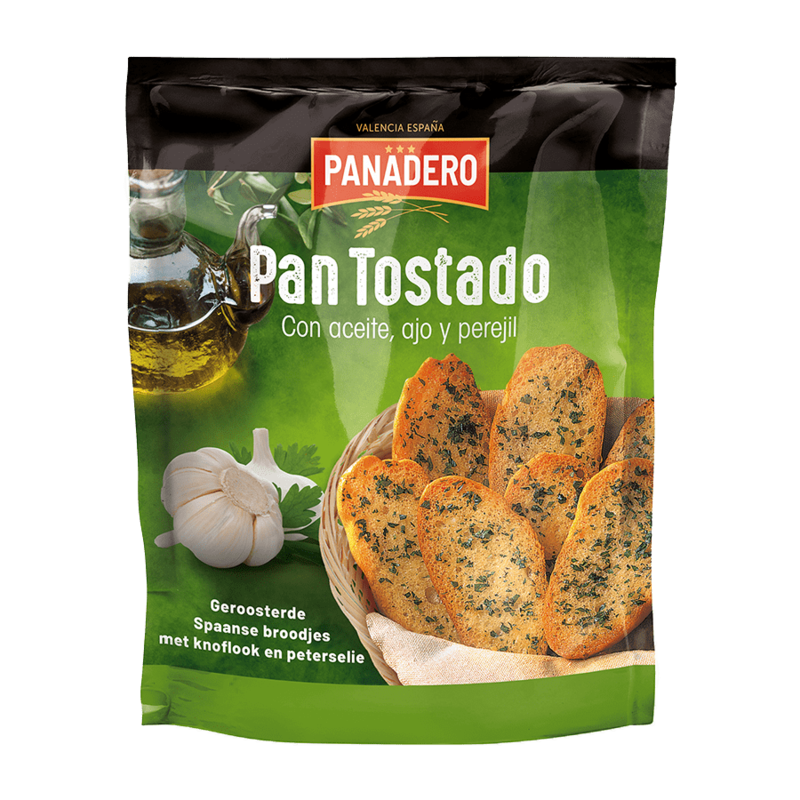 Spanish toasted sandwiches with garlic, olive oil and garnished with parsley. 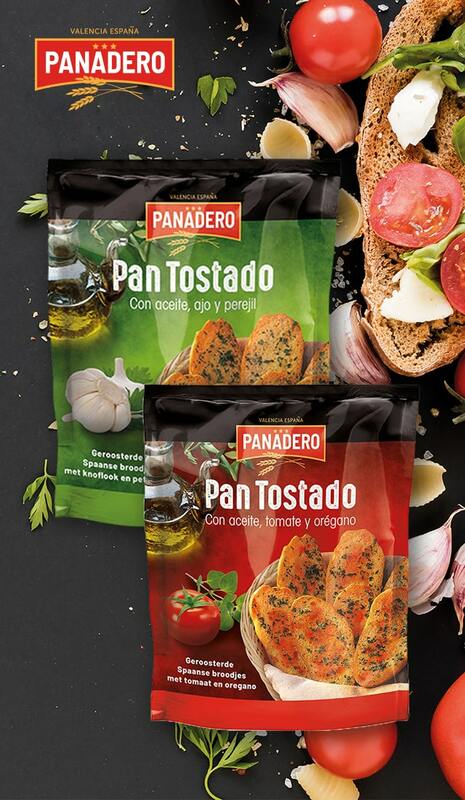 These Spanish delicacies are packed ready-made and can therefore be served immediately. Panadero is available in a 160g bag and is delicious as a snack, in advance, with the soup, the barbecue or next to the main meal! 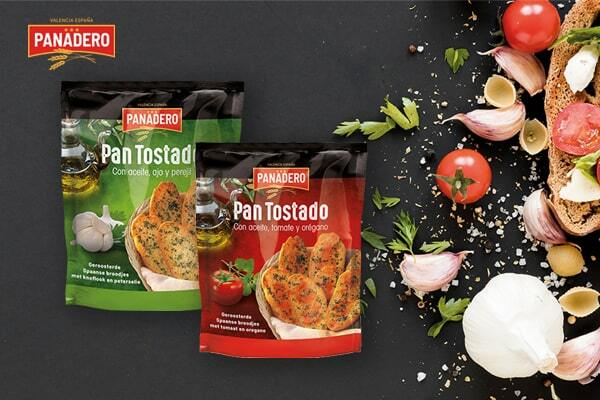 Panadero is available in the flavors 'olive oil, garlic & parsley' and 'tomato & oregano'. 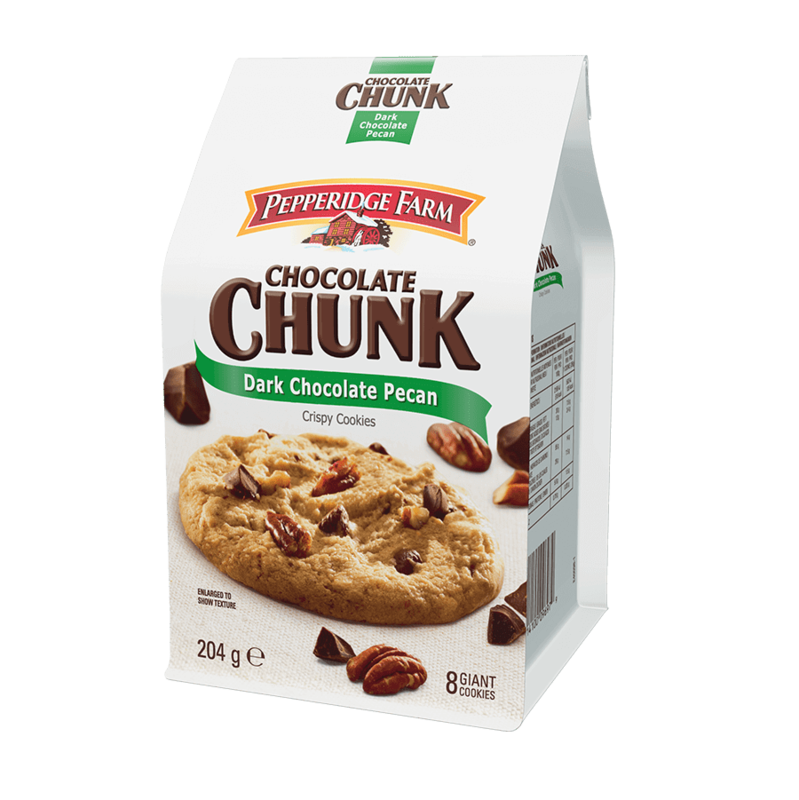 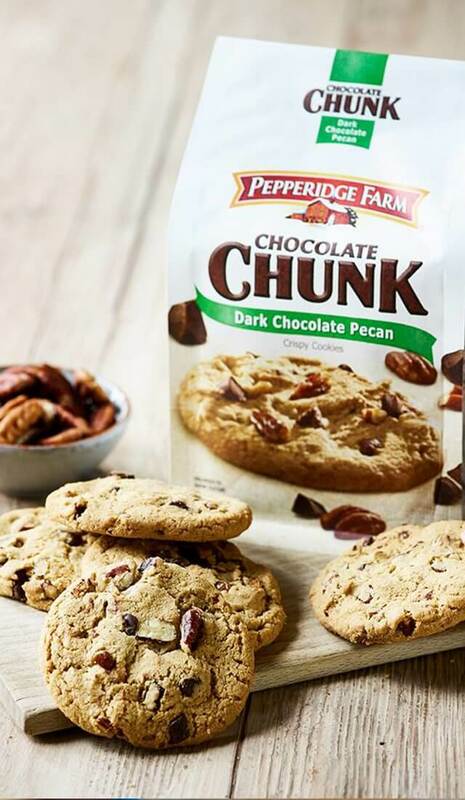 Pepperidge Farm Chocolate Chunk Cookies are the best chocolate cookies you have ever tasted. 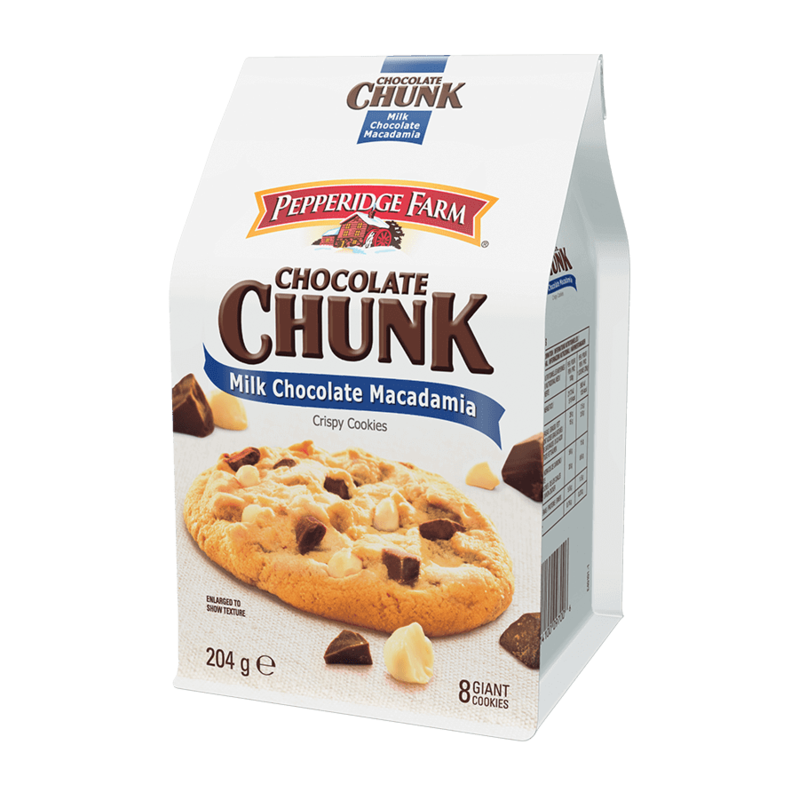 These delicious American cookies with large pieces of chocolate are now available in five flavors: Classic Dark Chocolate, Dark Double Chocolate, Dark Chocolate Pecan, Milk Chocolate Macadamia & White Chocolate Macadamia! 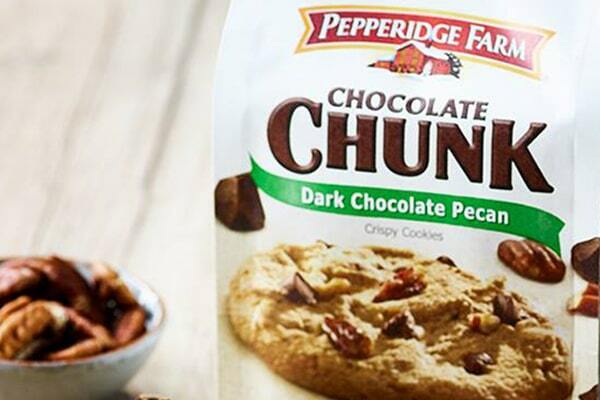 The Pepperidge Farm biscuits contain premium ingredients and they taste like freshly baked. 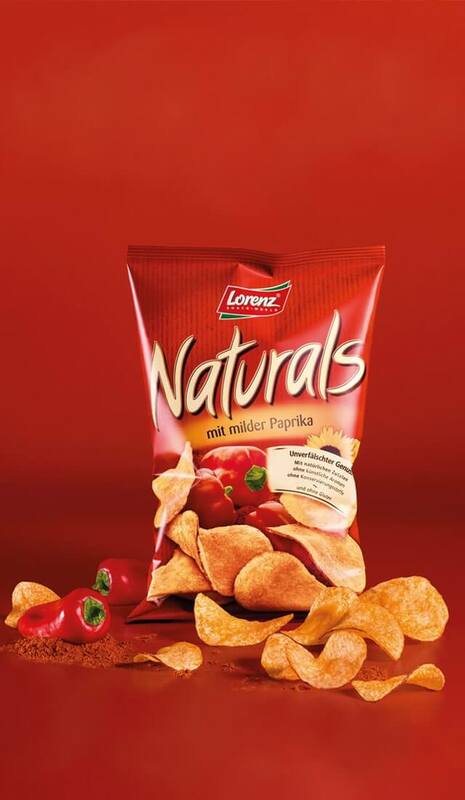 The guaranteed freshness is due to the double packaging with insulated compartments inside the bag. 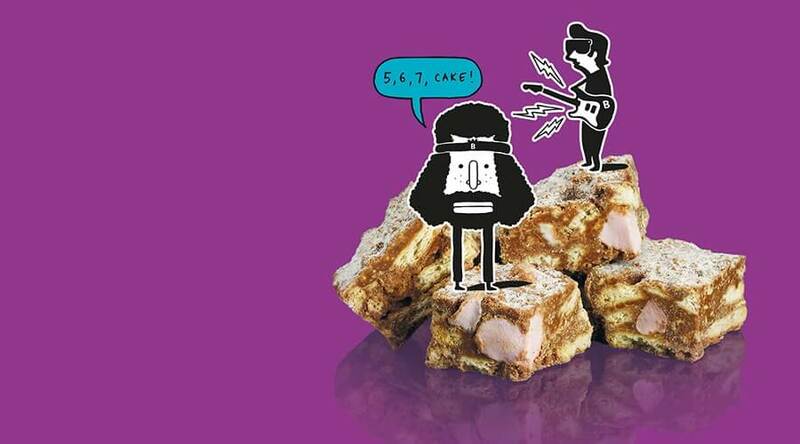 These cakes do not require any explanation, but you should taste them to understand that these cakes are a big hit in America! 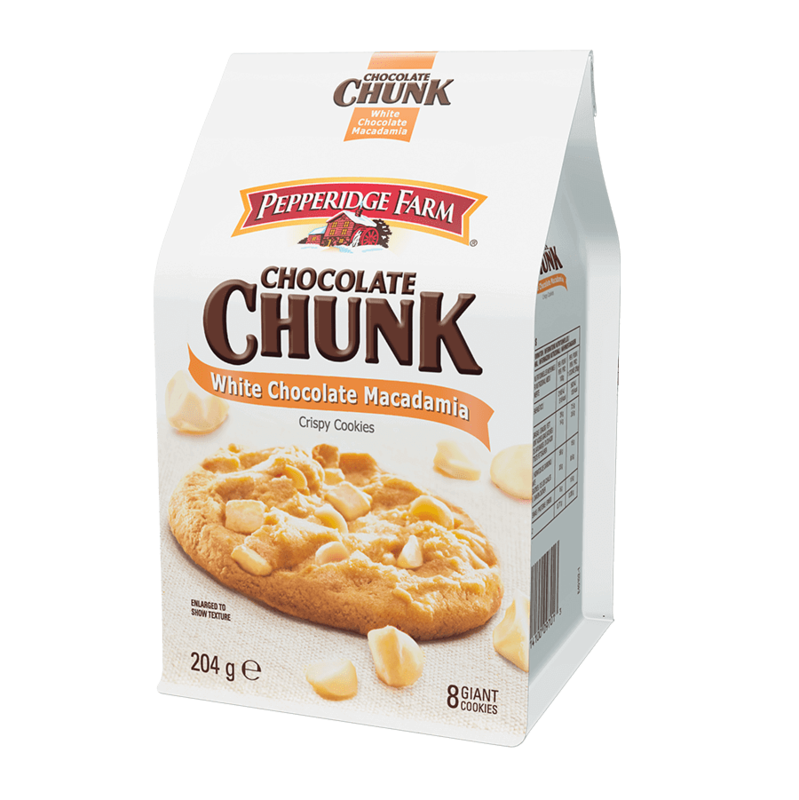 The Pepperidge Farm biscuits are available in two packages (220g, 204g) and five flavors. 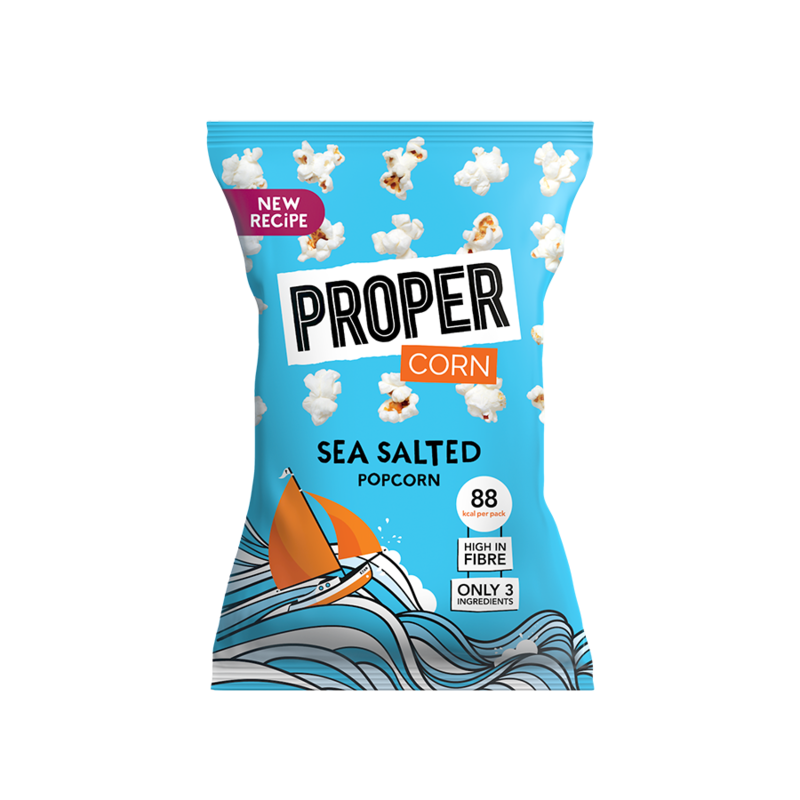 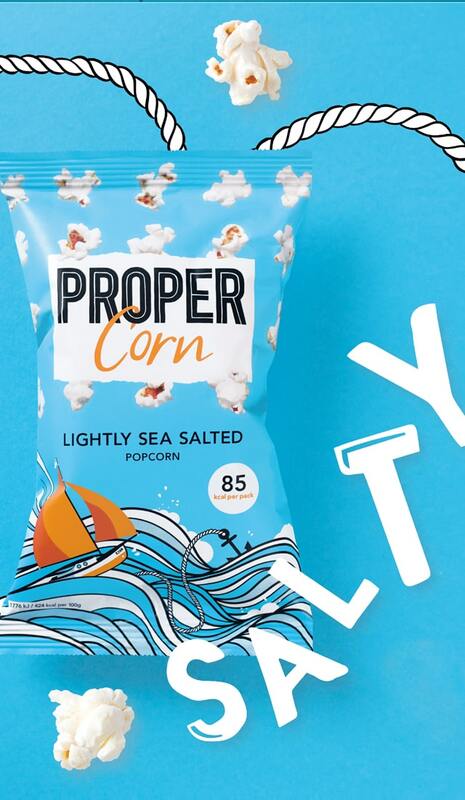 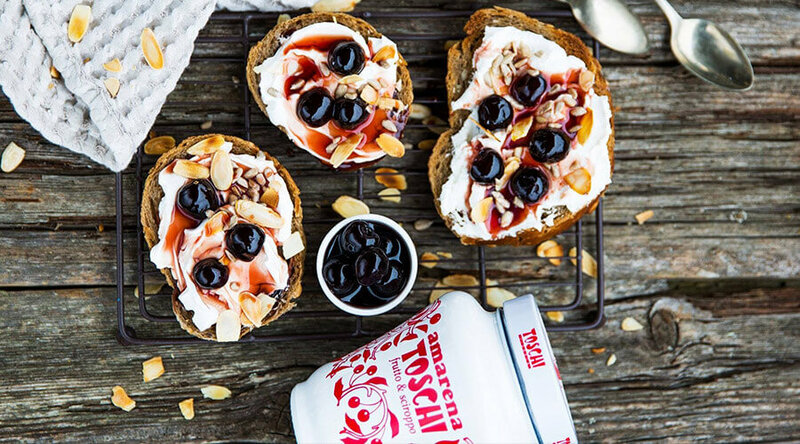 Propercorn has the mission to conquer the snack category with a healthy and tasty alternative popcorn in surprising flavors. 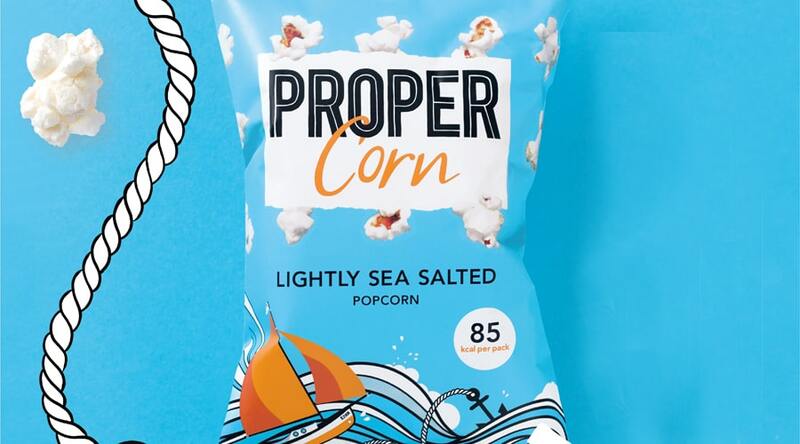 Each bag of Propercorn is made from the best quality popcorn and is low in calories. 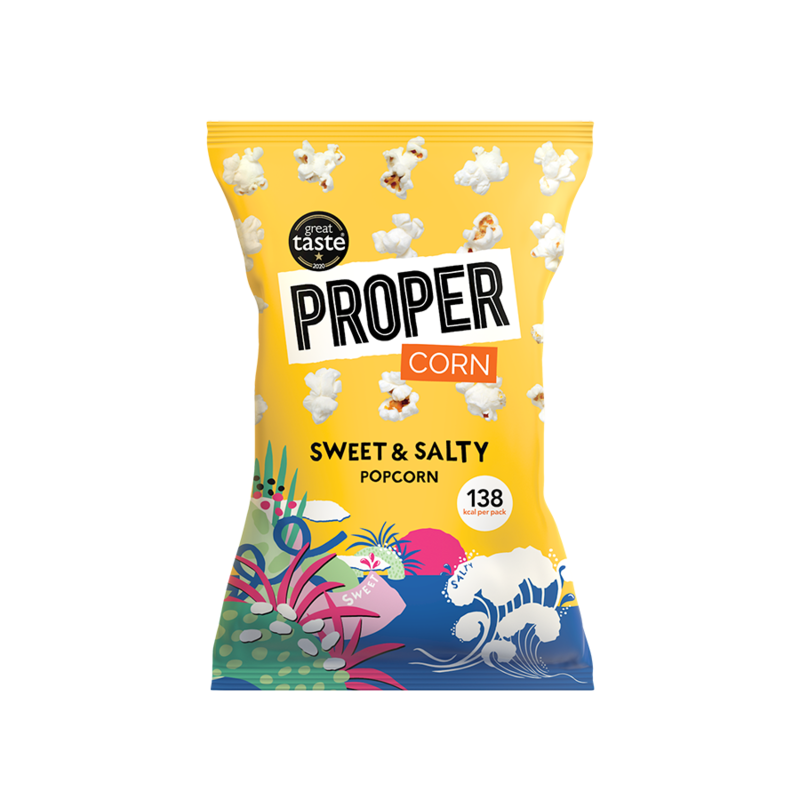 Propercorn uses butterfly popcorn that gives a deliciously light and crunchy texture. 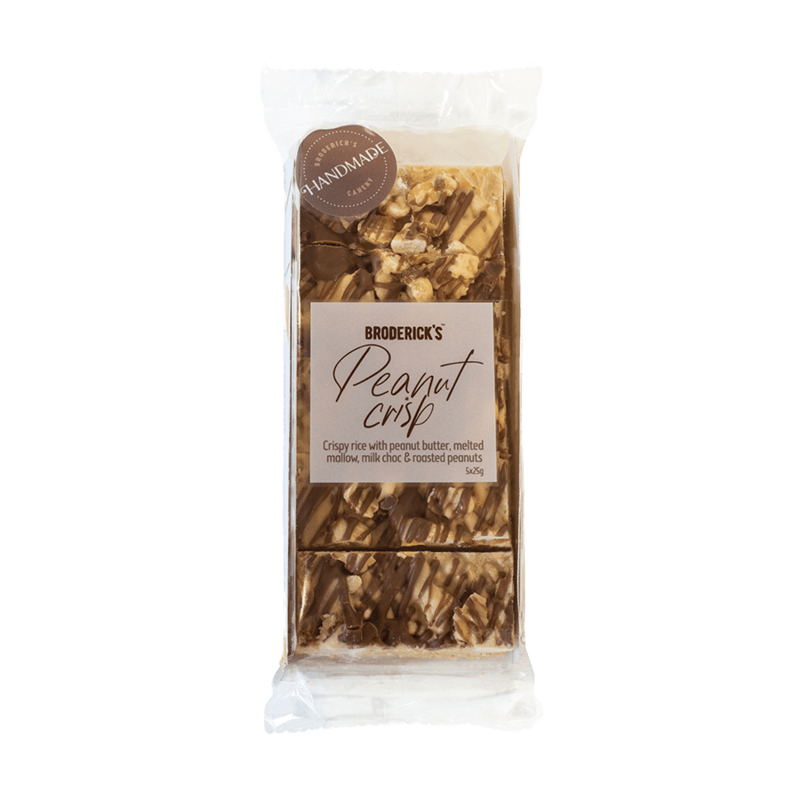 It is also a brilliant source of whole grain fibers. 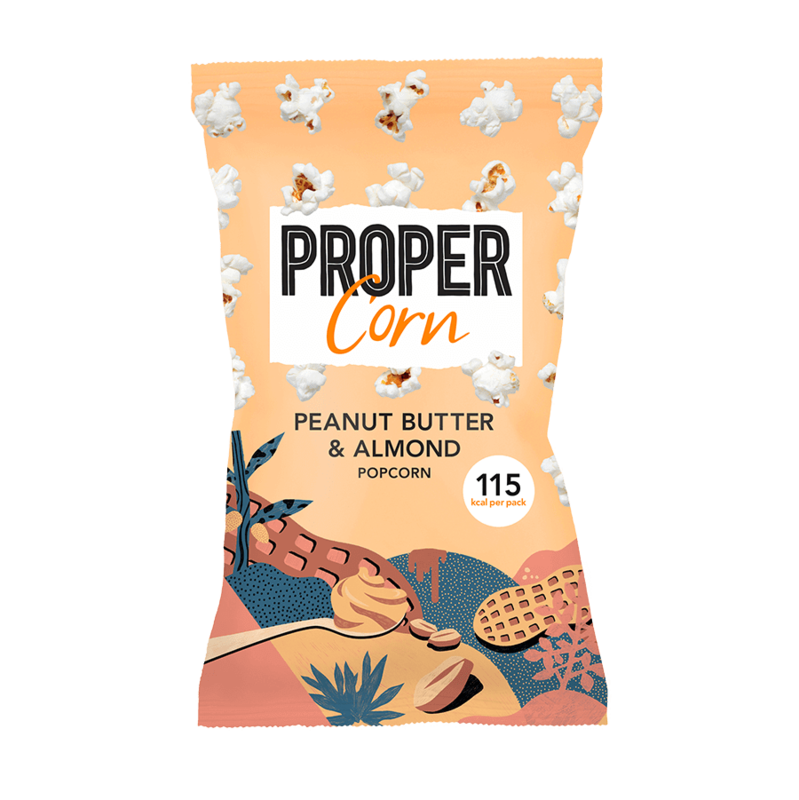 The recipes come to life in the Propercorn kitchen and are unique. 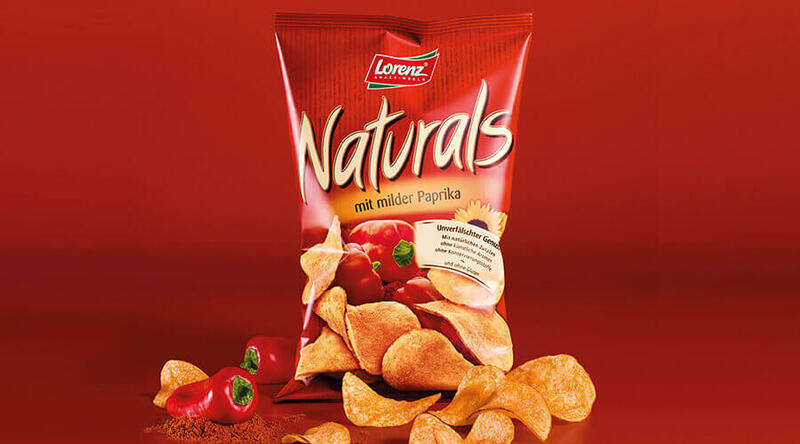 Only natural ingredients are used, which give every bag a delicious full flavor. 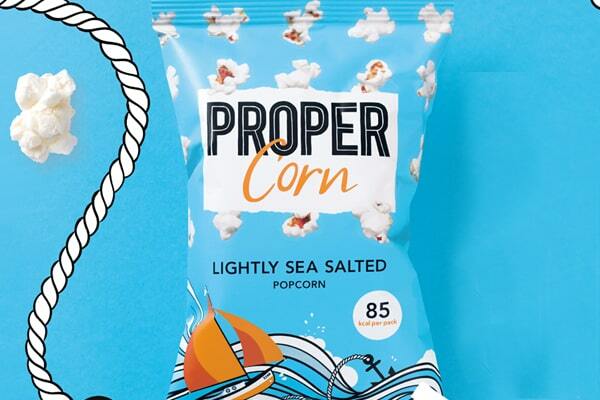 Propercorn believes in balance and snacking without compromise. 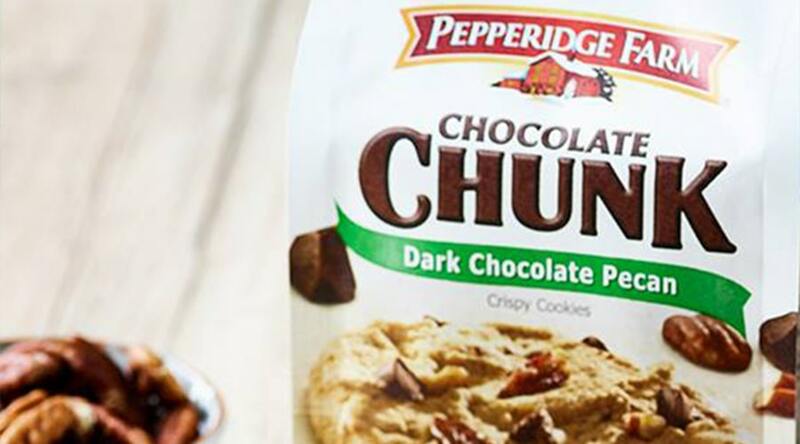 Taste comes first and every flavour never has more than 130 calories per portion. 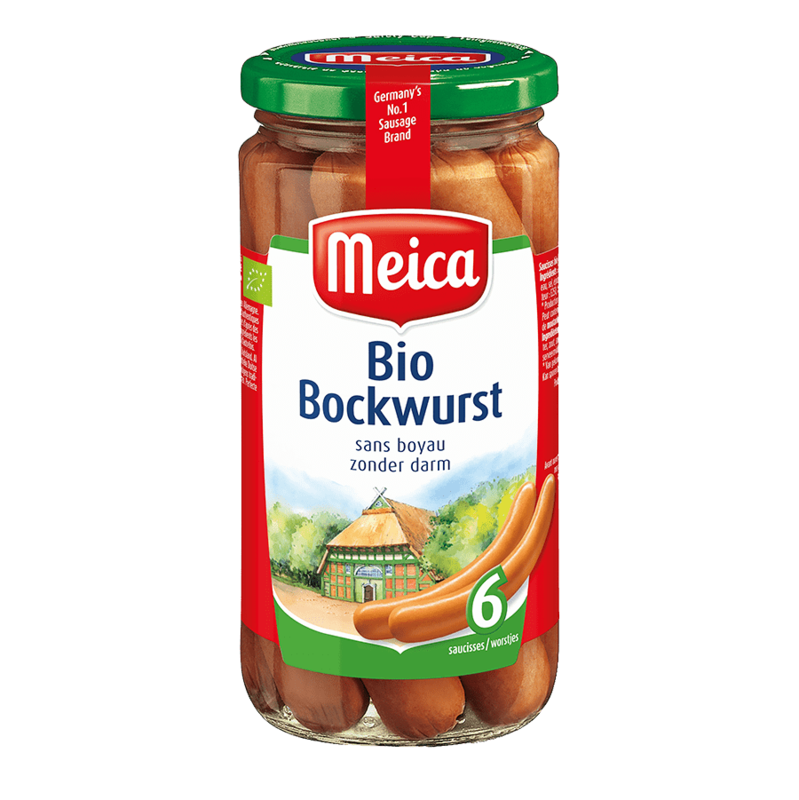 Moreover, it is gluten-free and vegetarian. 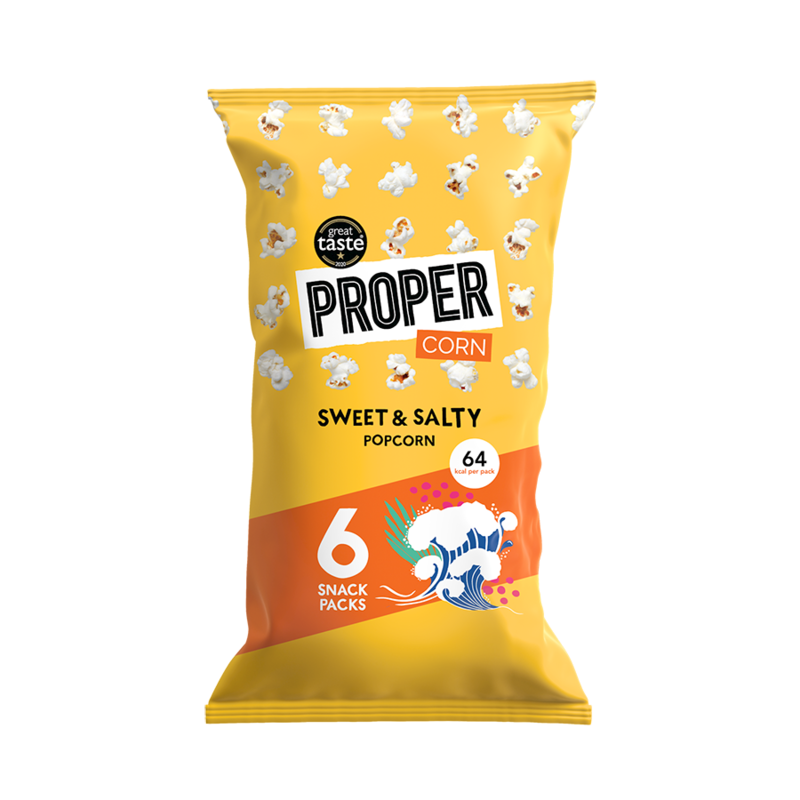 Propercorn is available in two packages (small bags: 20g, 26g, 30g, big bags: 70g, 90g, 100g, multipack: 6x14g) and five flavors. 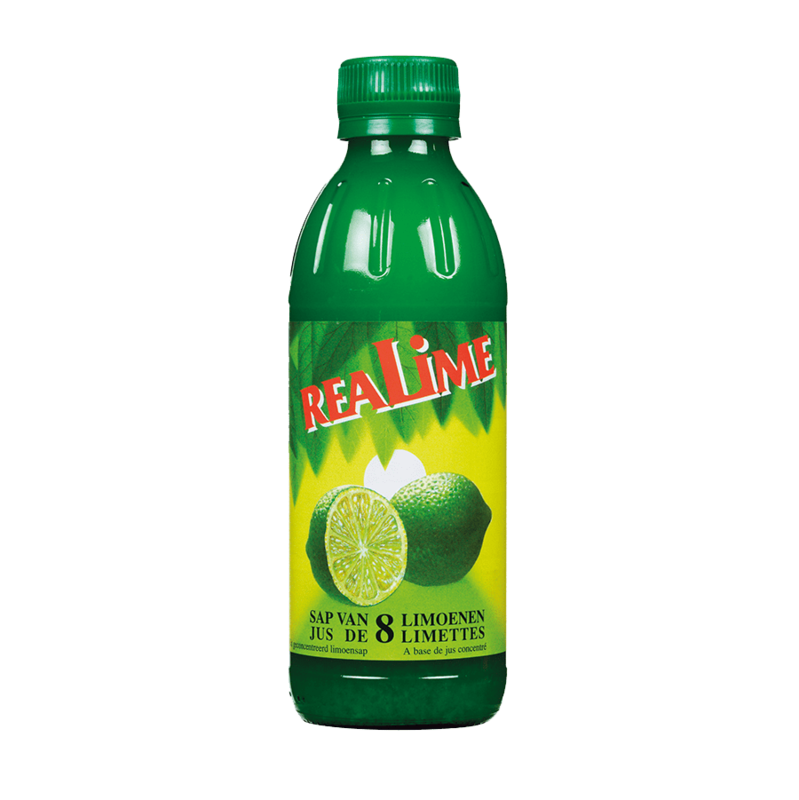 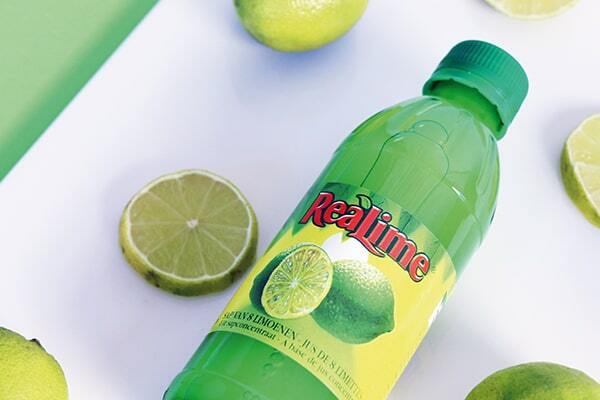 ReaLemon lemon juice and ReaLime lime juice are squeezed from selected lemons and limes and contain no colorings or added sugars. 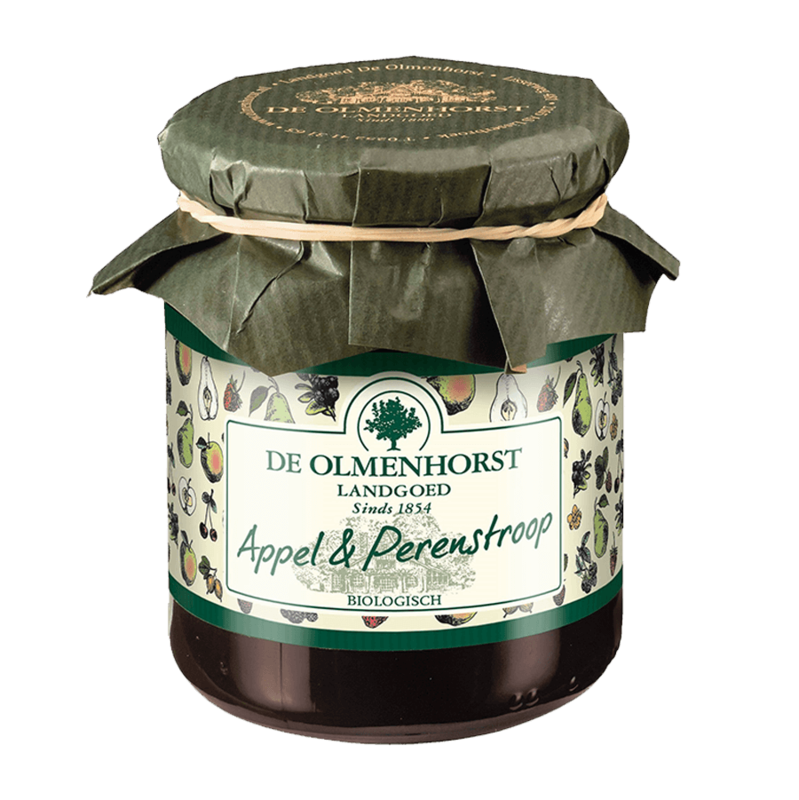 Next to that, both are rich in vitamin C and have a long shelf life. 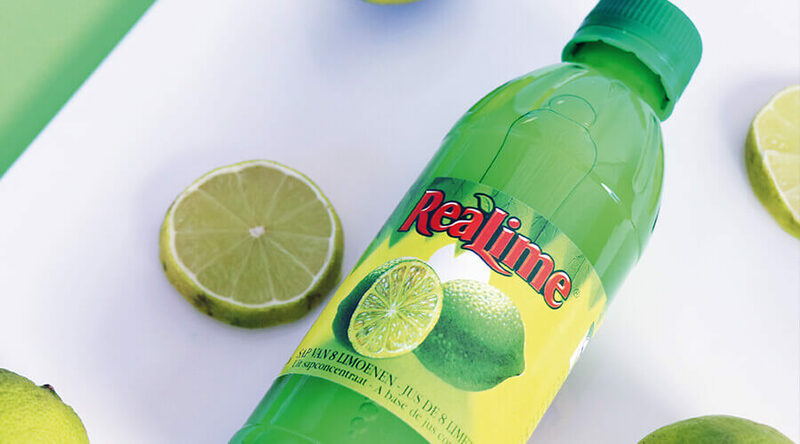 The juice is filled in a green glass bottle, the best protection against light and air. 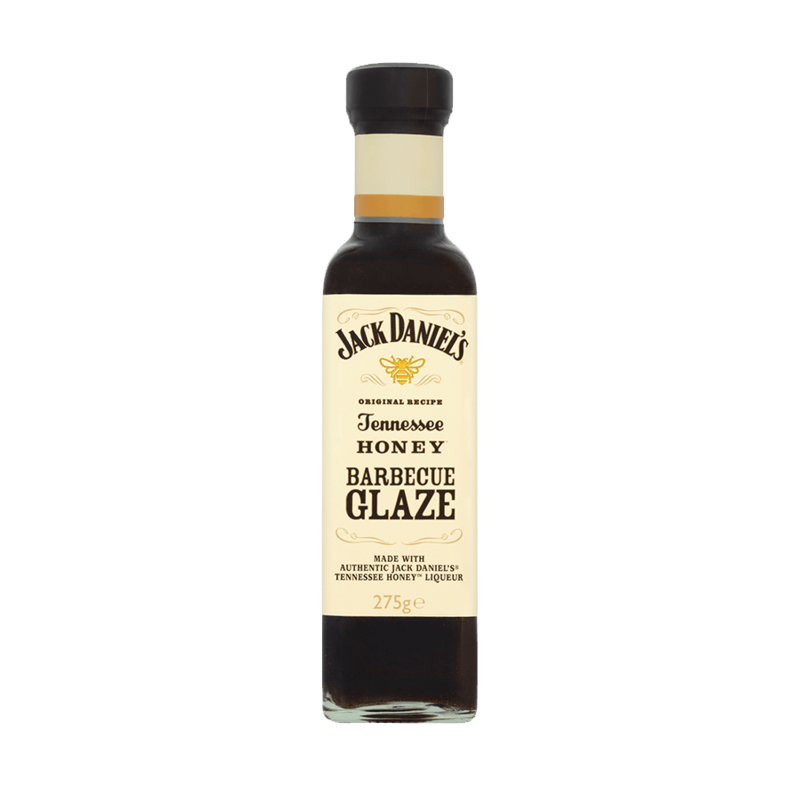 The bottle is equipped with a unique dosing cap for pouring and dripping. 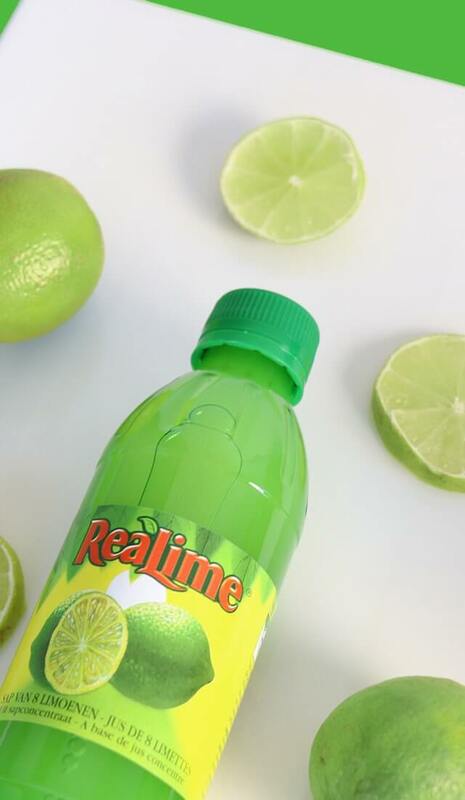 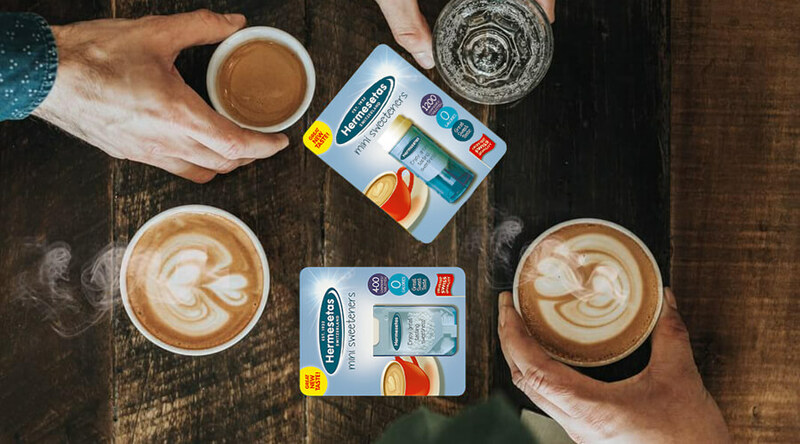 ReaLemon is available in 250ml and 500ml and ReaLime in 250ml. 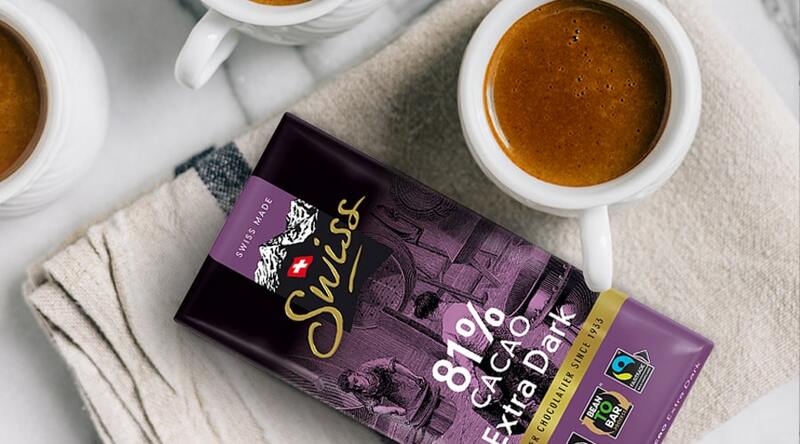 Did you know that the origin of each cocoa bean in Swiss chocolate tablets is known and traceable? 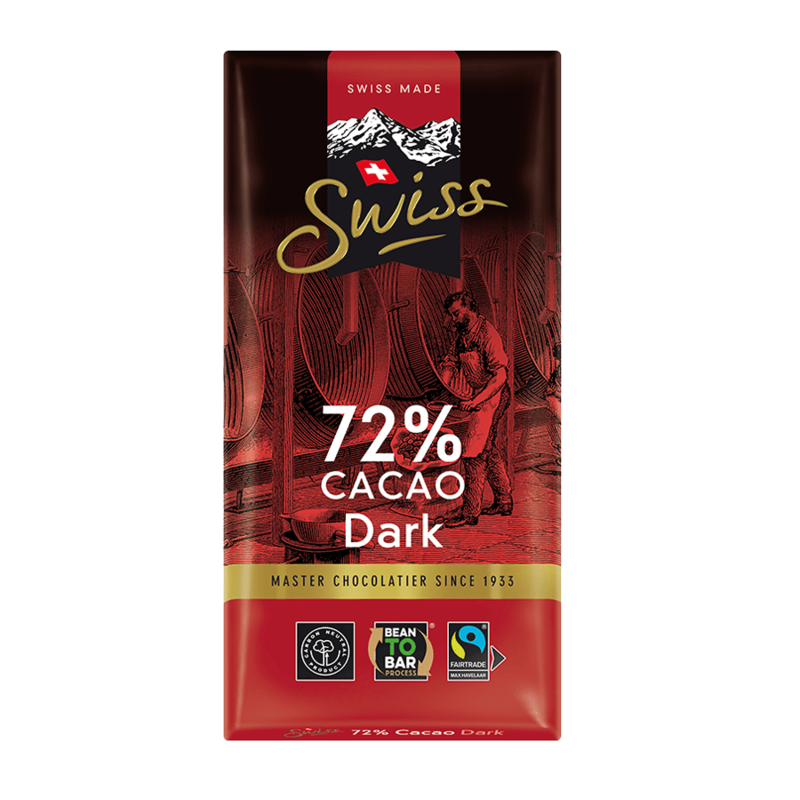 Swiss is involved in the production process from 'bean to bar'! 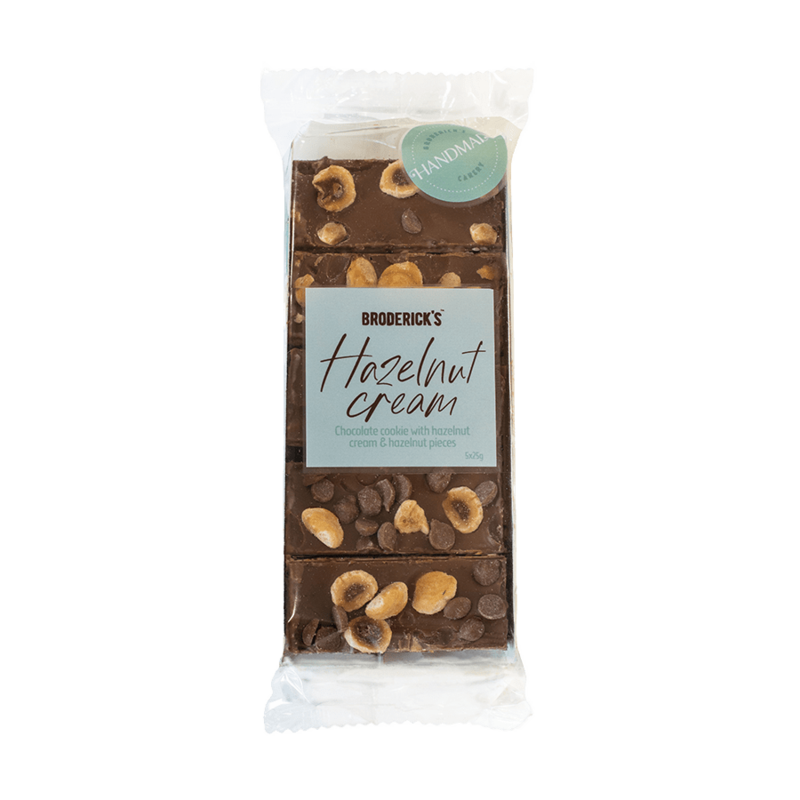 A 'bean to bar' chocolate maker is a chocolate maker who is responsible for purchasing the cocoa beans, roasting himself, grinding the nibs himself, adding other flavoring ingredients, slowly conching and then pouring the couverture into a mold. 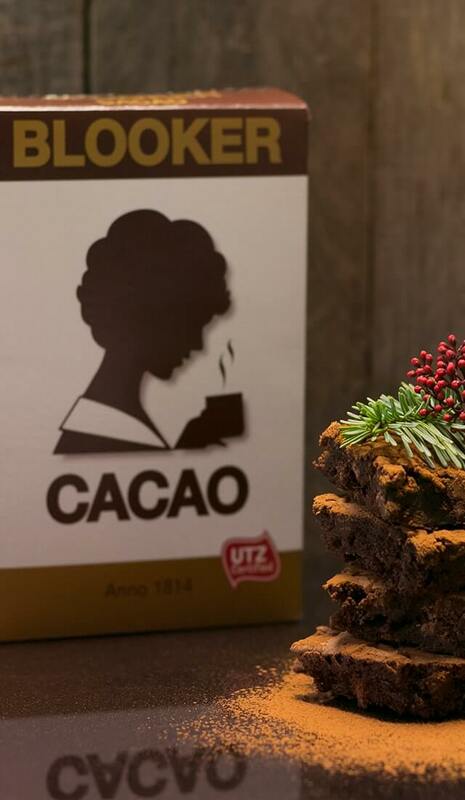 In short, the chocolate is made entirely from cocoa bean to bar its own process. 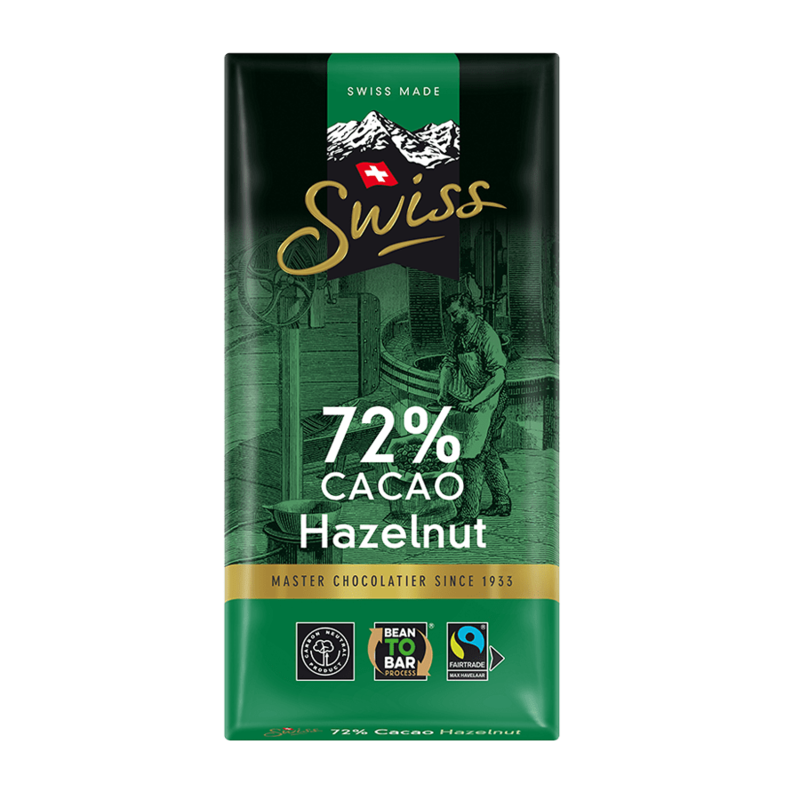 The origin and quality of each cocoa bean has a big influence on the taste! 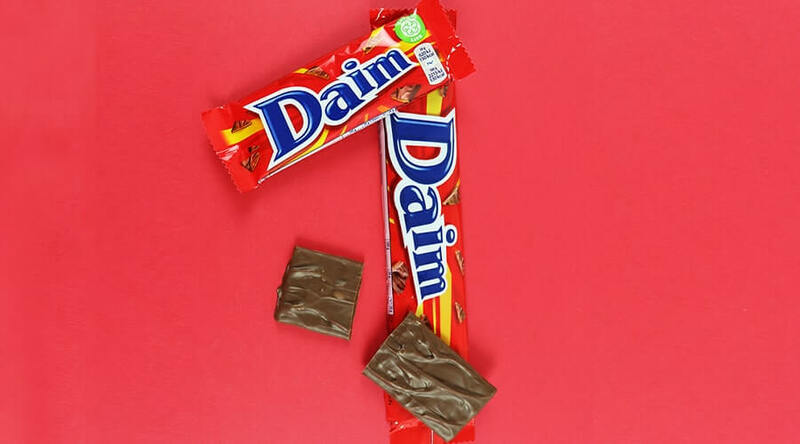 The assortment of Swiss chocolate consists of 2 lines with a total of 4 tablets. 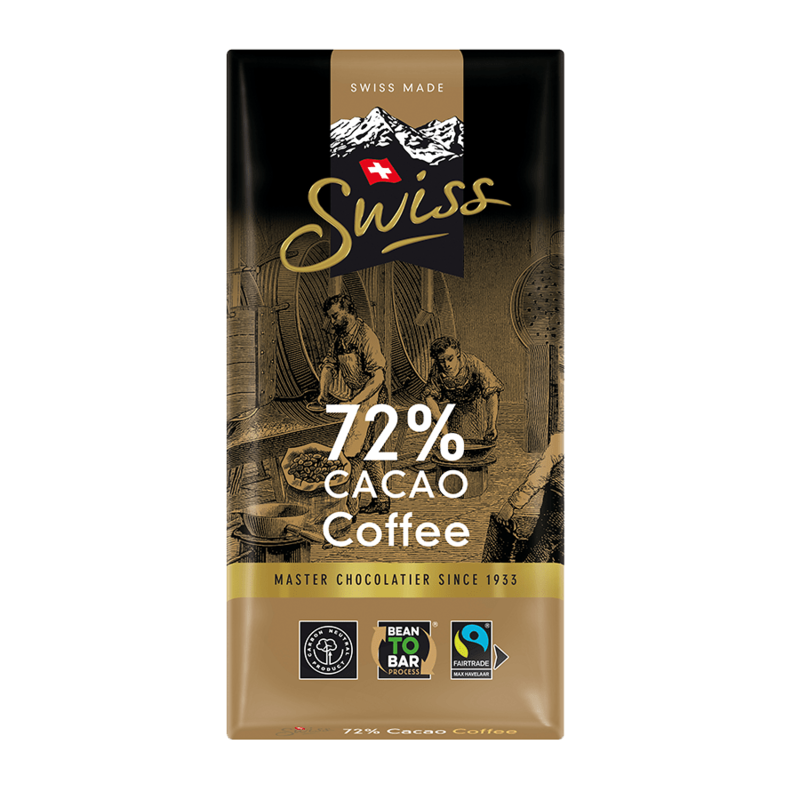 The 72% cocoa tablets are available in the delicious flavors Noir, Noir Noisette and Noir Café. 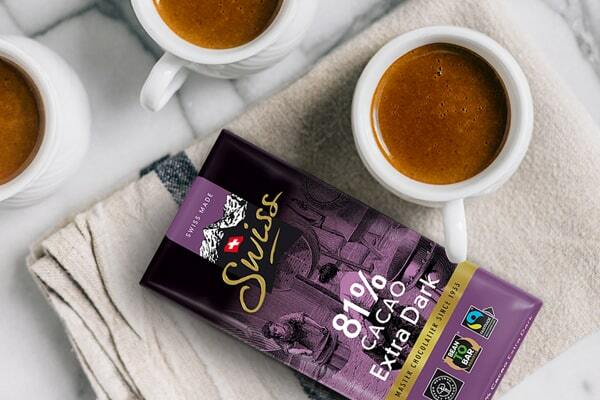 For the real cocoa lovers there is the Swiss Noir Finest Collection. 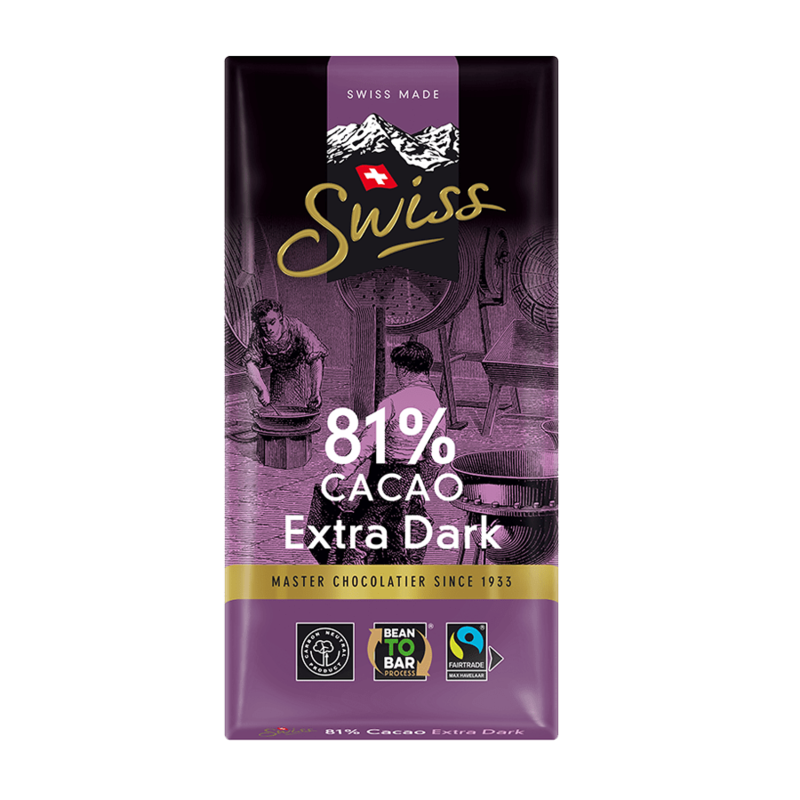 This flavor contains no less than 78% cocoa and is therefore even more intense in taste! 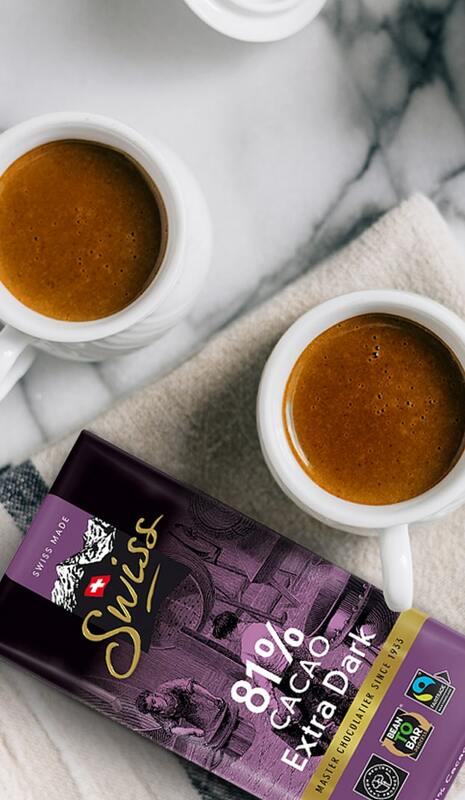 The Swiss Noir Finest Collection is available in the Noir taste, in a 100g tablet. 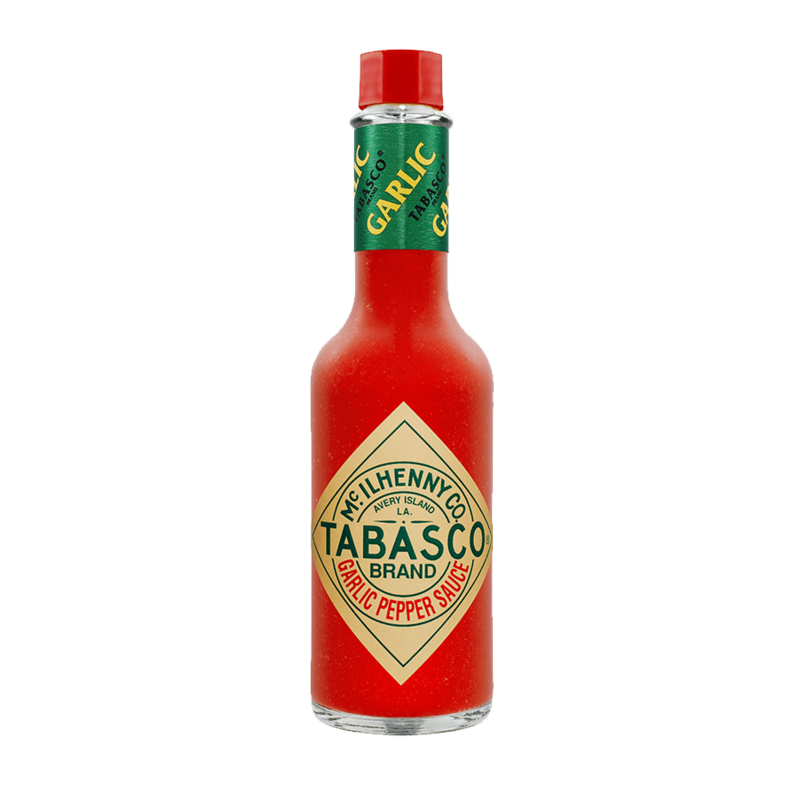 TABASCO® pepper sauce is the seasoning for many dishes and is distinguished from other pepper sauces by its intense taste. 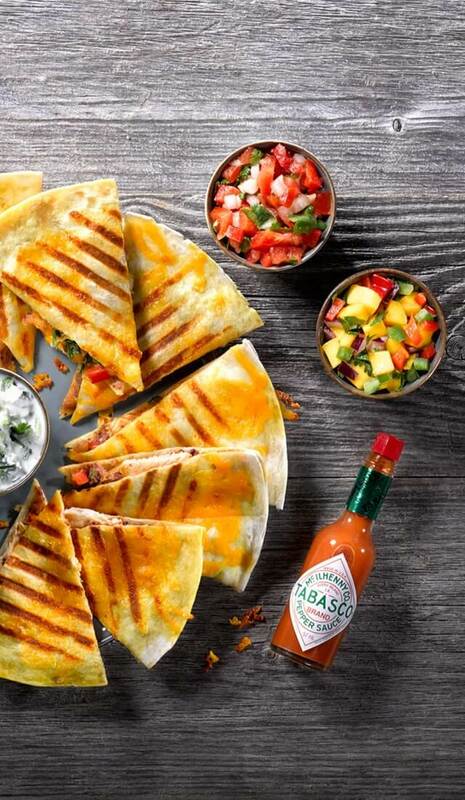 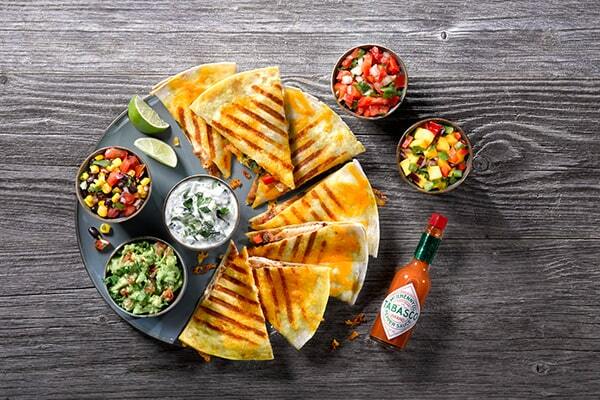 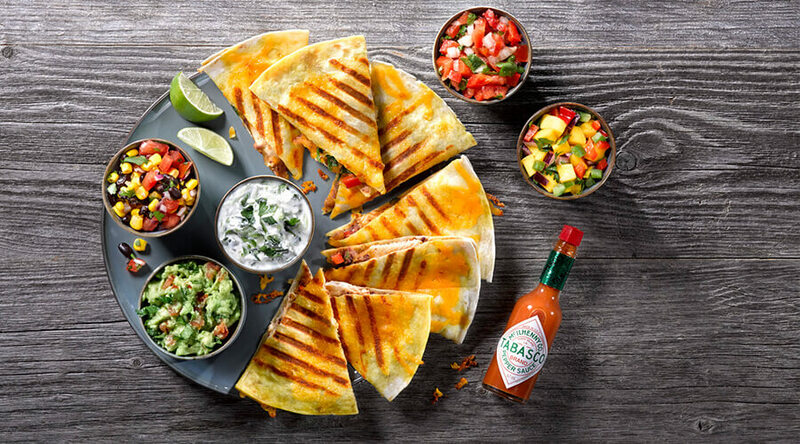 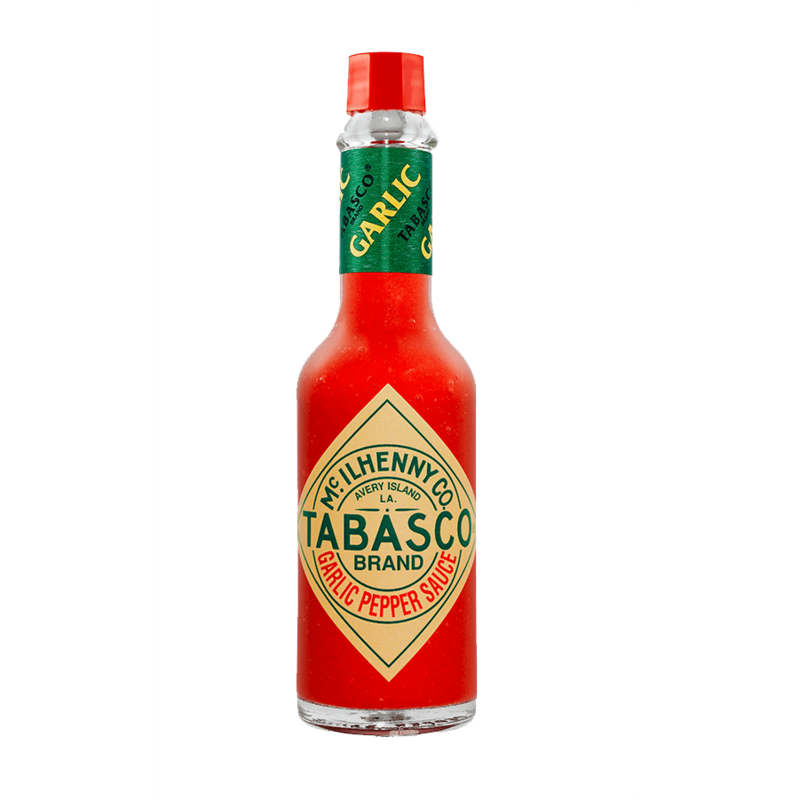 TABASCO® is particularly suitable for adding more flavor to pizzas, meat, pasta sauces and many other dishes. 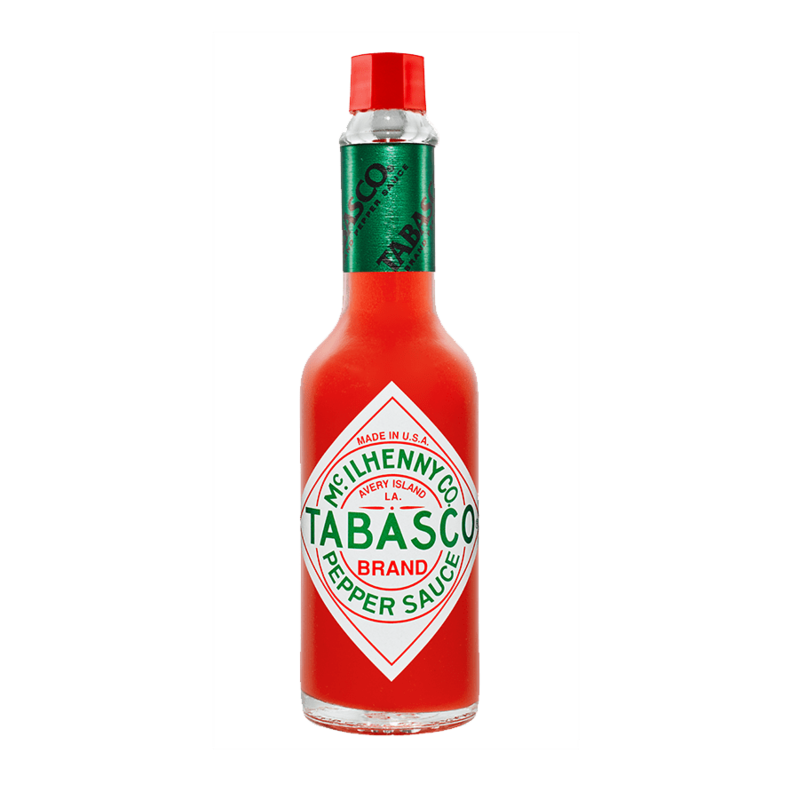 Since 1868 the TABASCO® pepper sauce is produced in the same fashion. 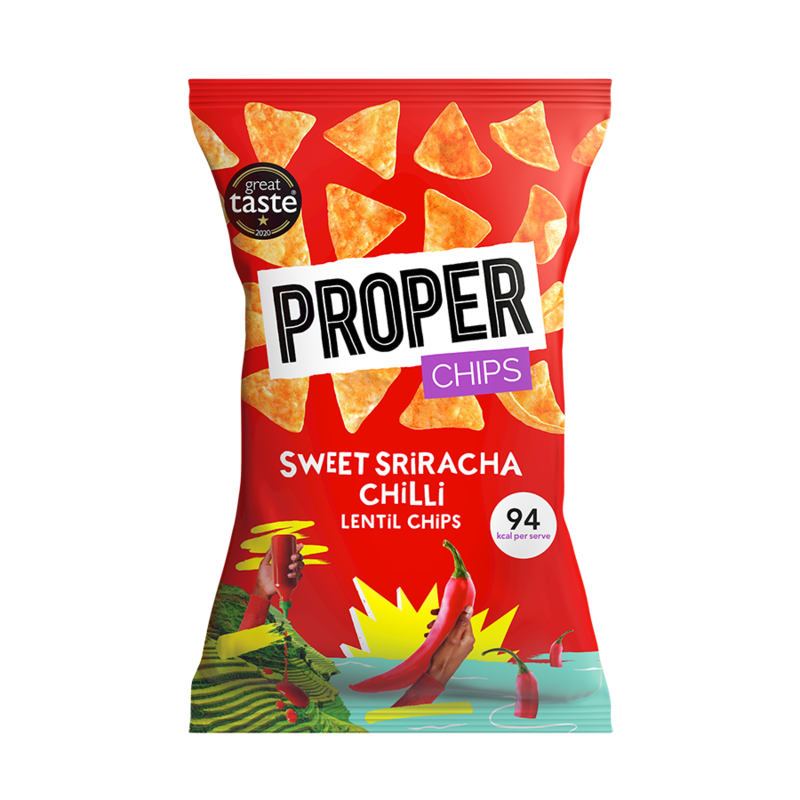 Once the sun-ripened peppers have the perfect deep red color they are picked by hand. 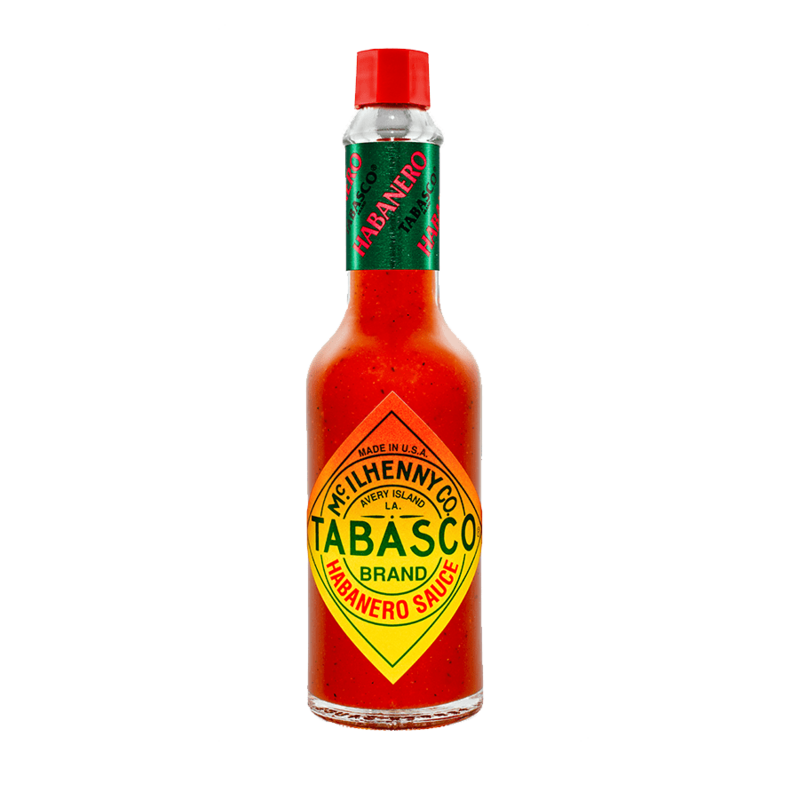 At the factory the peppers are crushed and mixed with Avery Island salt. 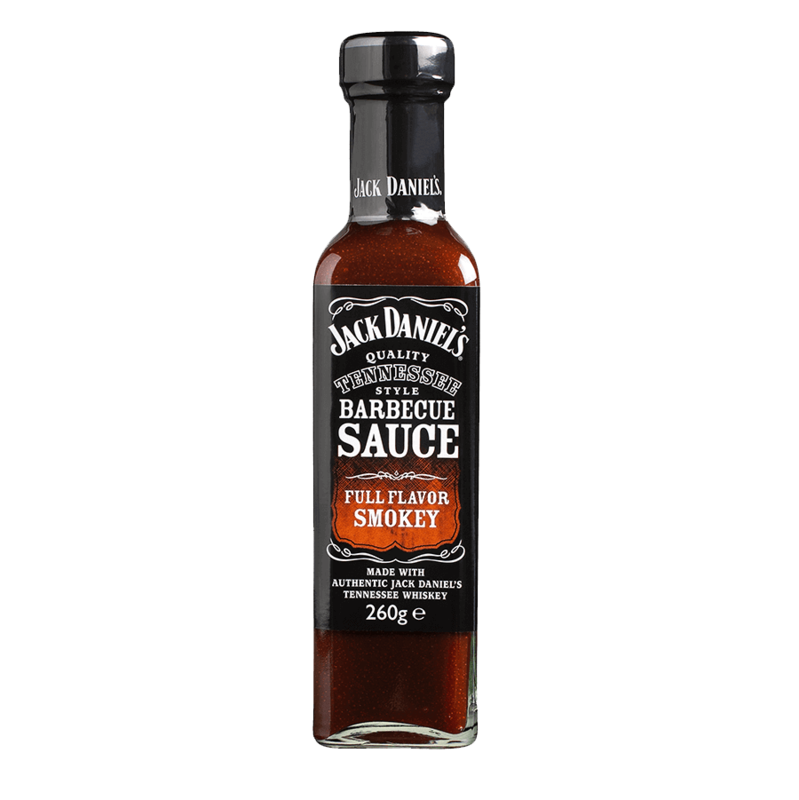 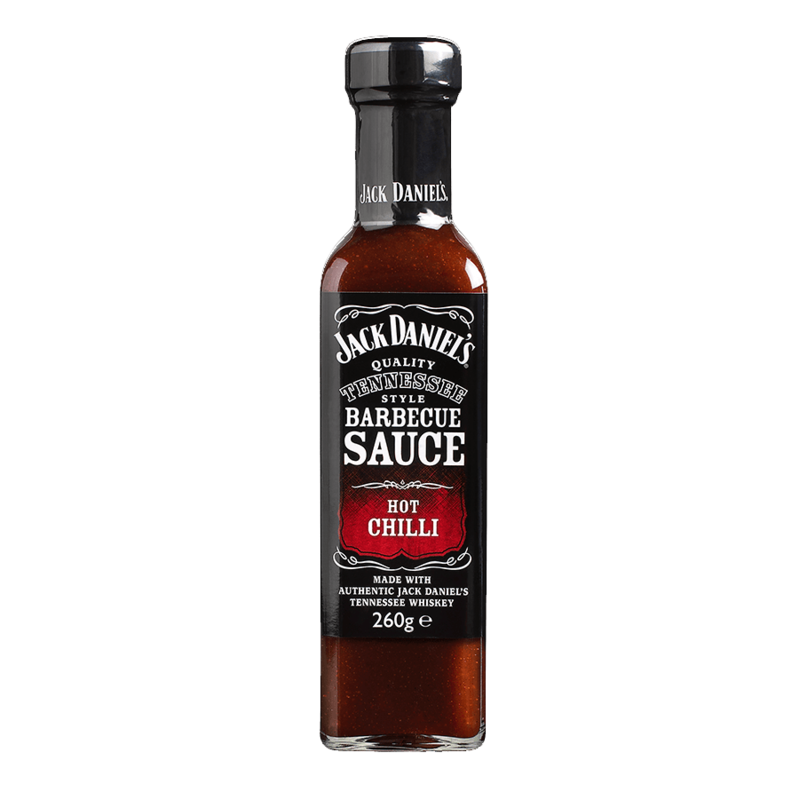 The red pepper sauce is available in a 60ml and 350ml bottle. 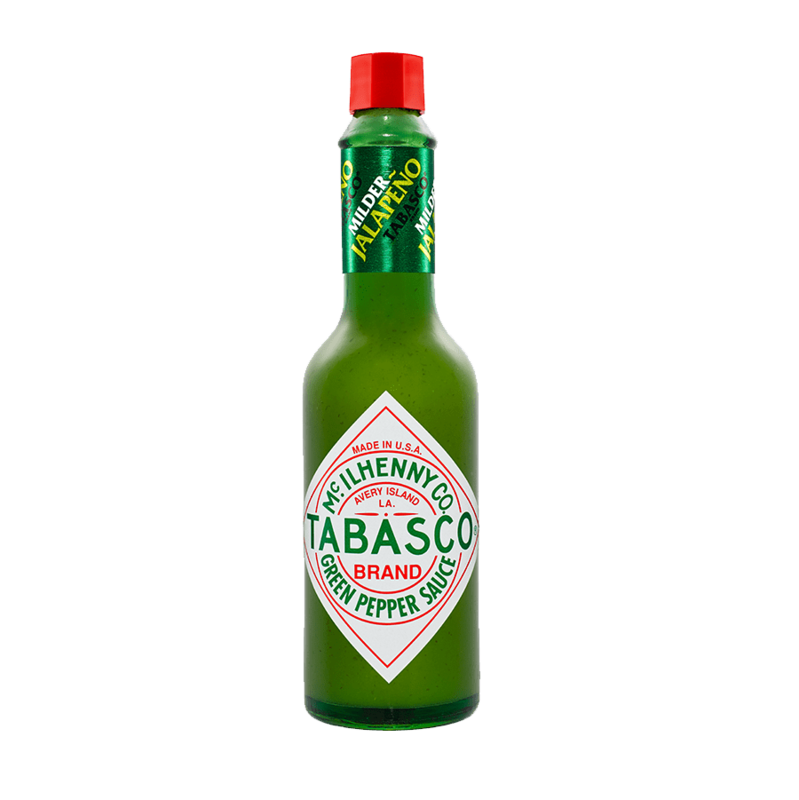 The green pepper sauce (a milder version with jalapeño peppers), the Chipotle (with smoked jalapeño peppers), Habanero (extra spicy) and Garlic variety are available in a 60ml bottle. 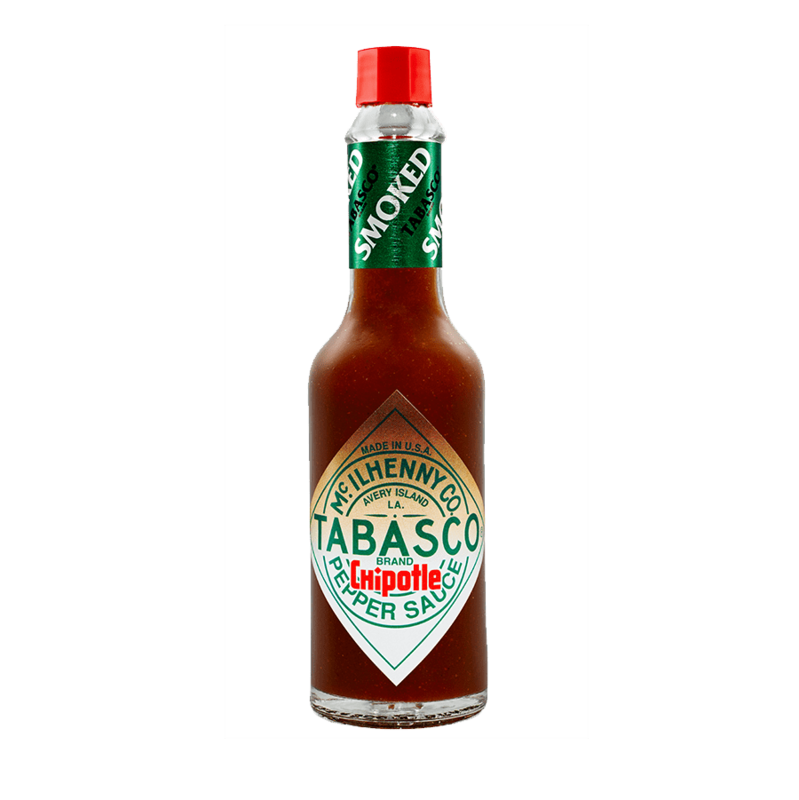 Larger sizes, TABASCO® articles and spicy promotional materials are now also available from the Europea TABASCO® webshop. 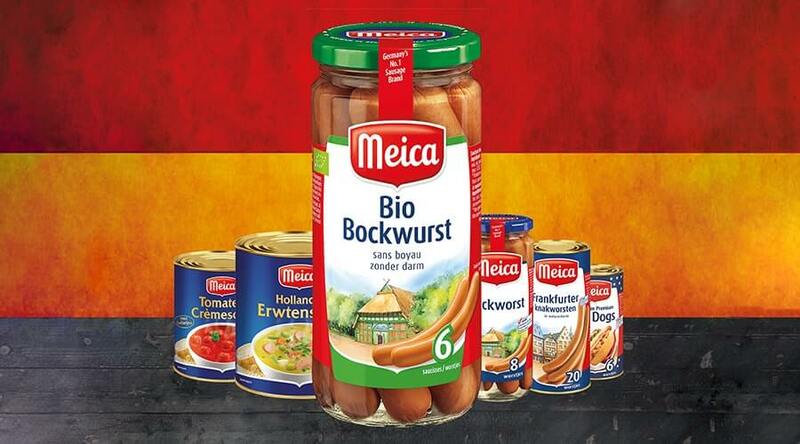 Shipping throughout Europe! 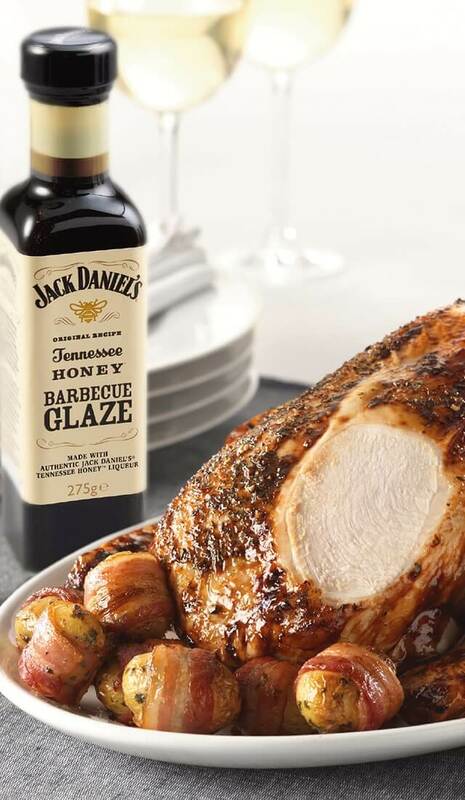 For more information see the link below. 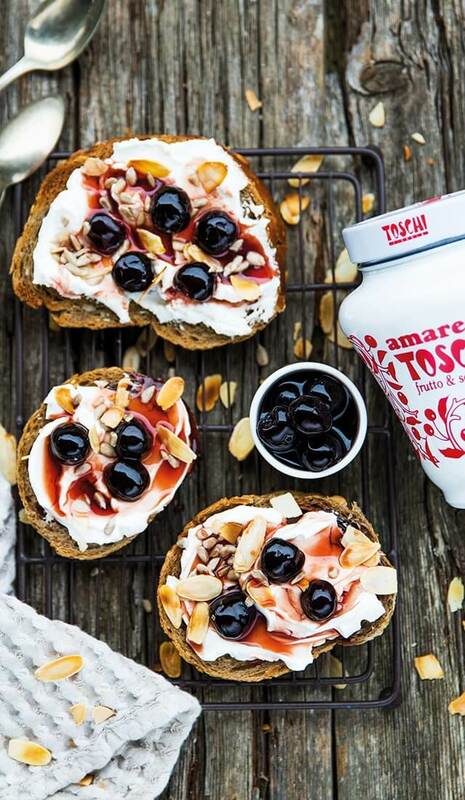 Amarenes are sour cherries that are particularly suitable for making syrup, jam or for decoration. 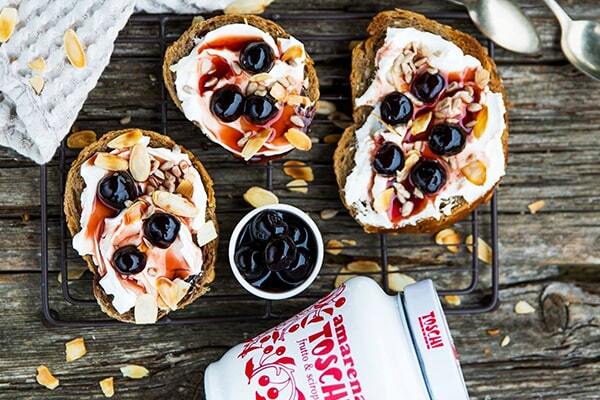 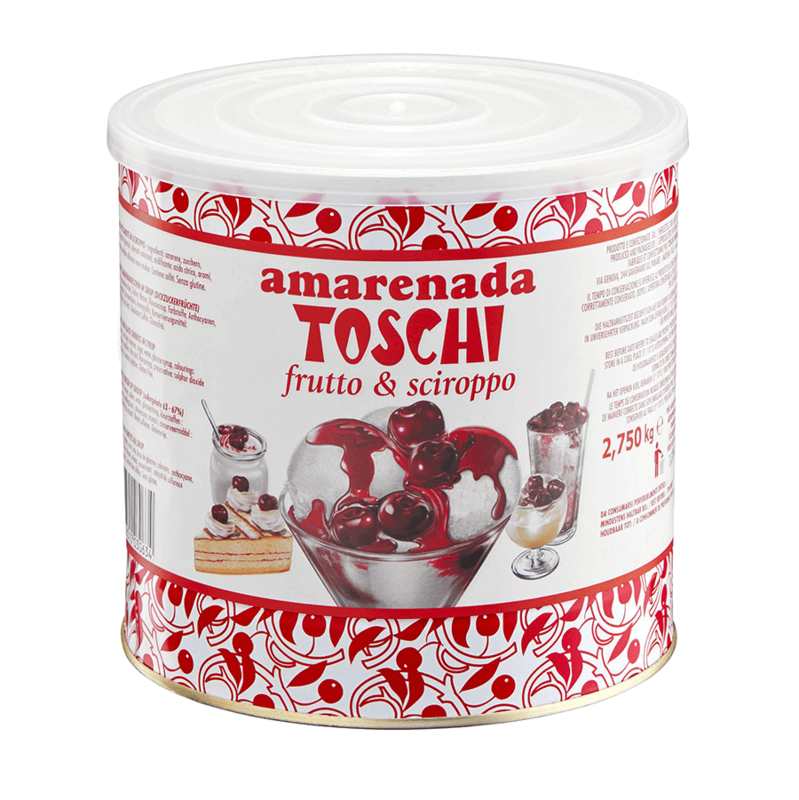 Toschi selects the best Amaren cherries from Italy. 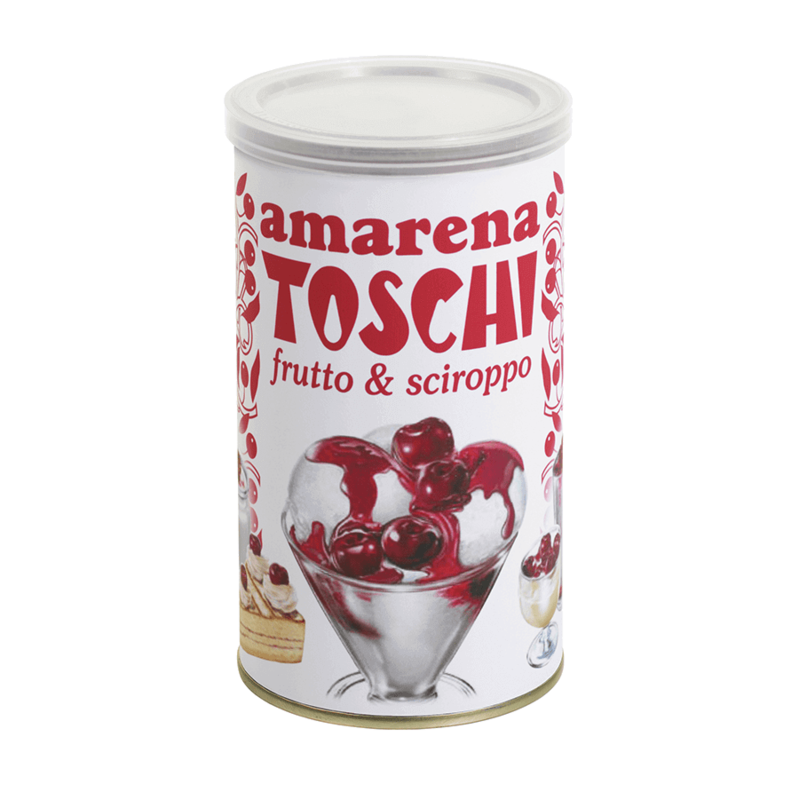 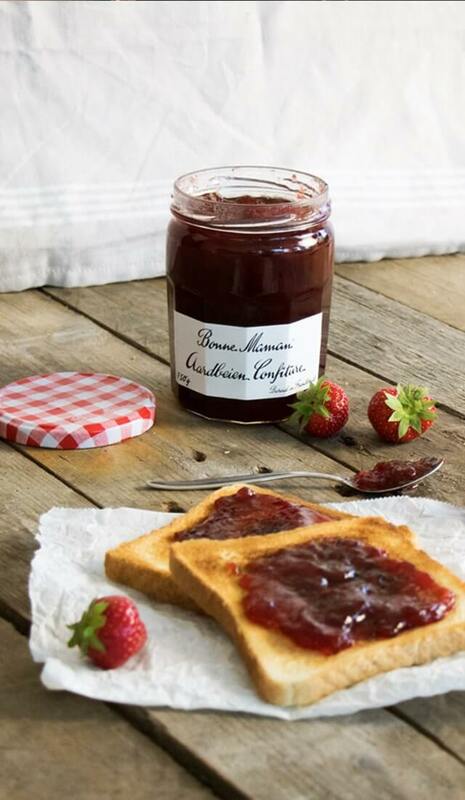 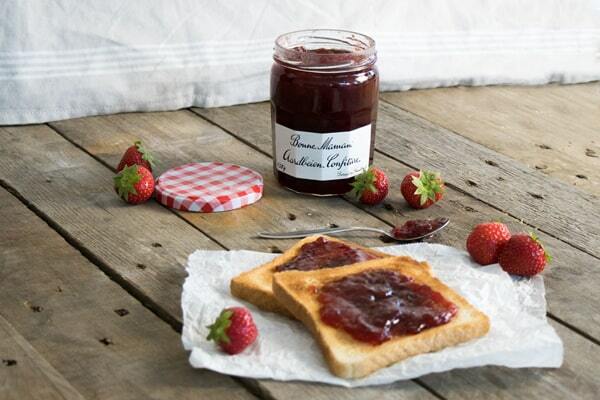 In a 400g tin there are over 65 Amaren cherries in a delicious syrup. 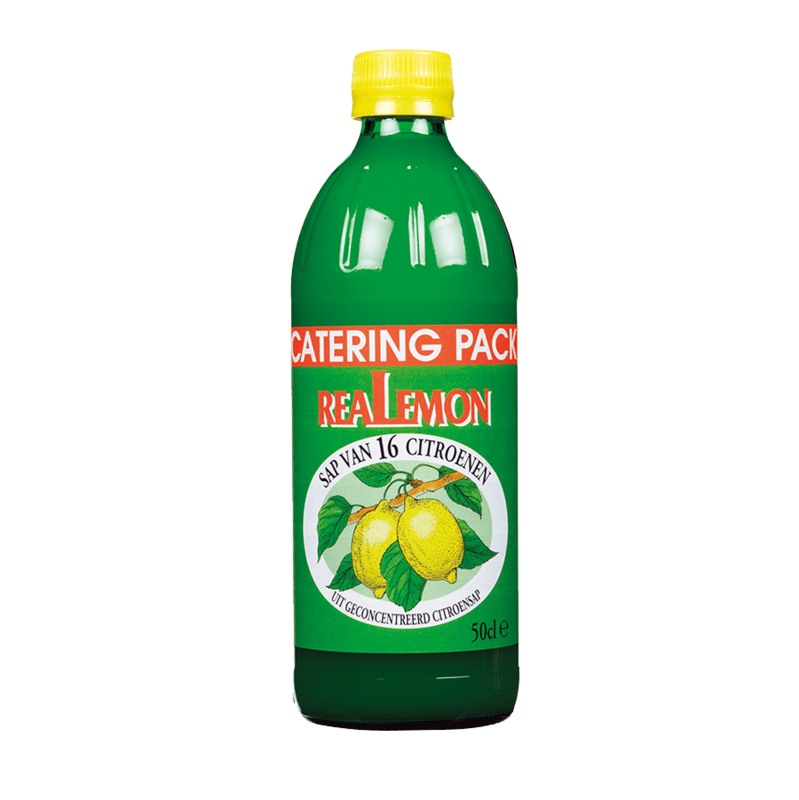 Ideal for decoration of ice cream and cakes or as an ingredient in, for example, smoothies or sorbets. 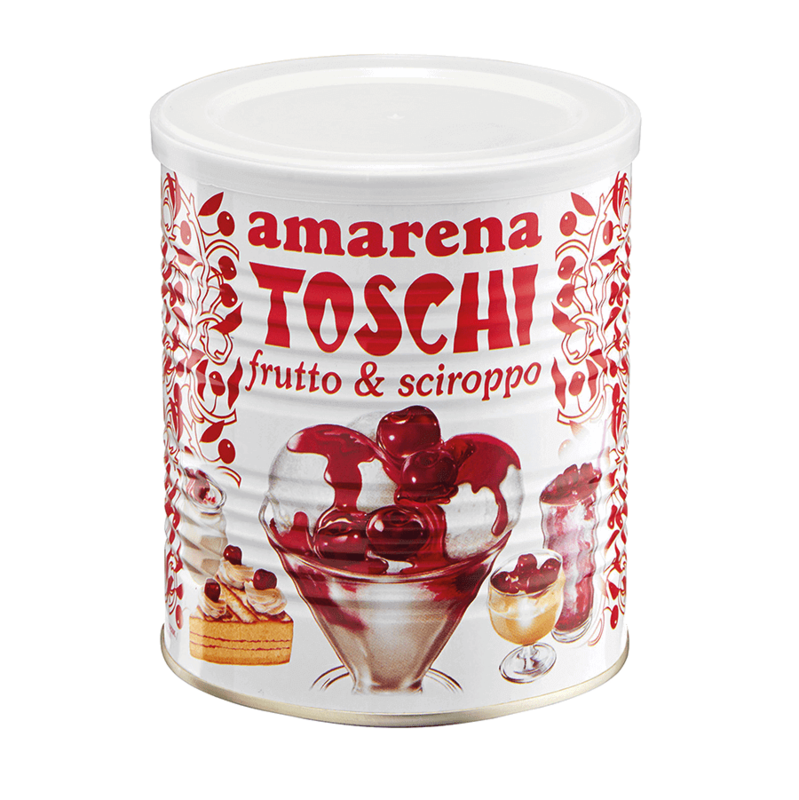 In addition, the Amaren cherries are available in a tin of 1000g and 2,75kg. 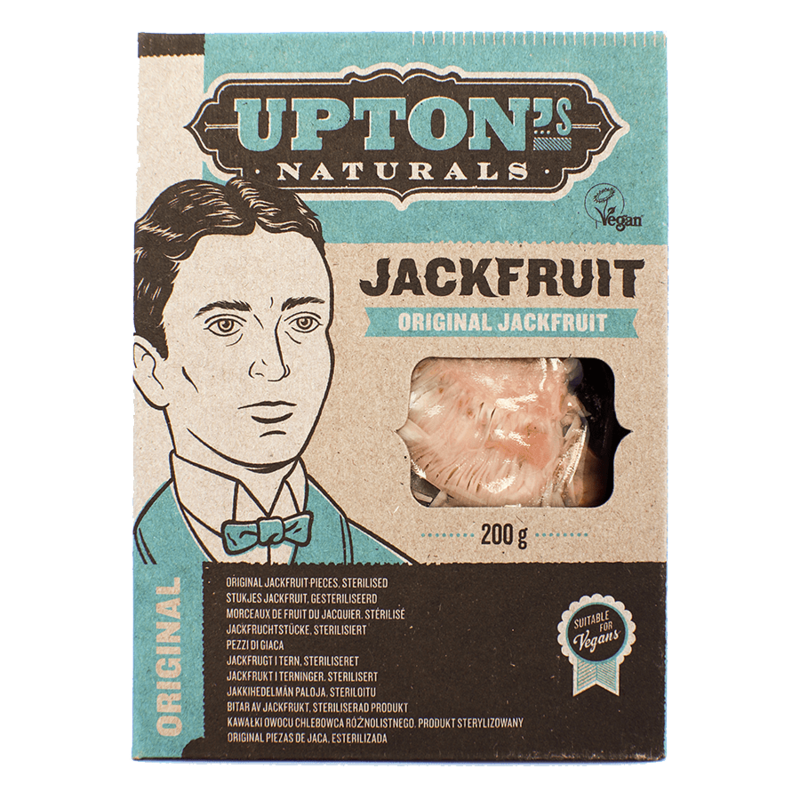 Upton’s Naturals Jackfruit is a unique ready-to-eat meat and fish substitute based on jackfruit! 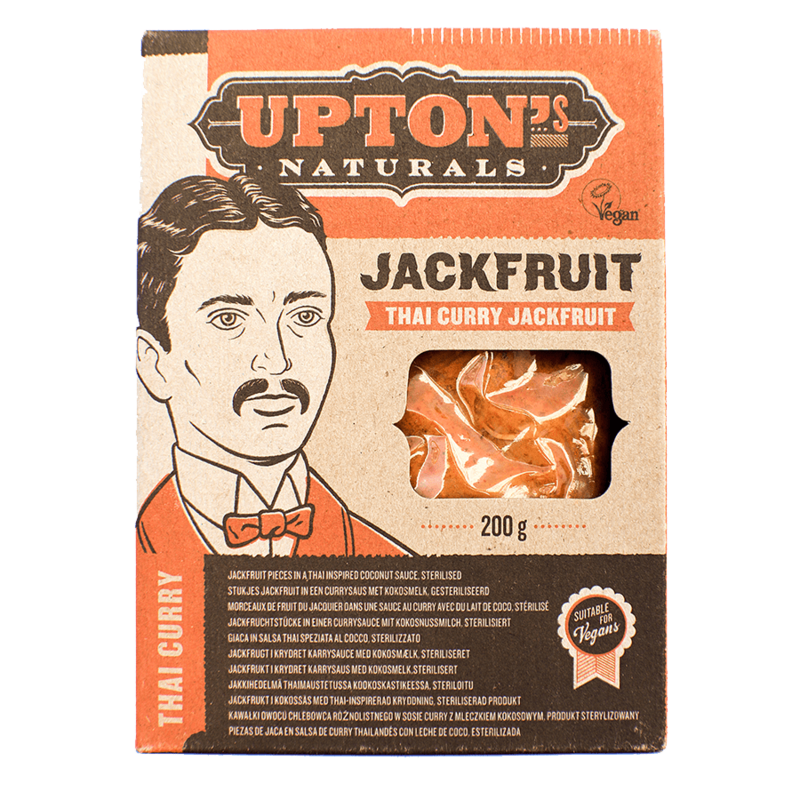 Jackfruit is a type of fruit that is high in fiber and low in fats and carbohydrates. 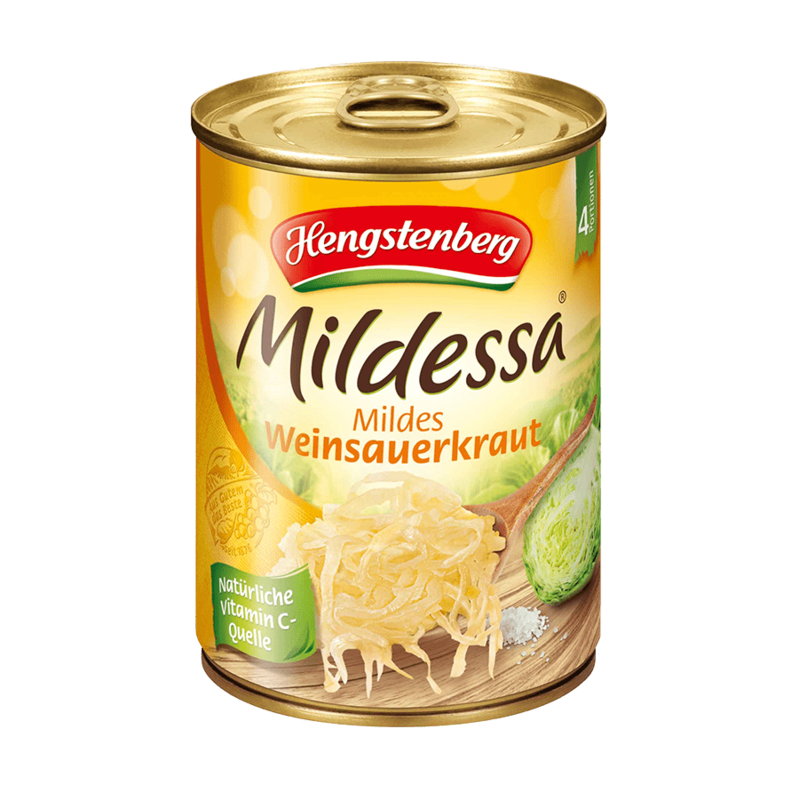 In addition, it is soy and wheat free. 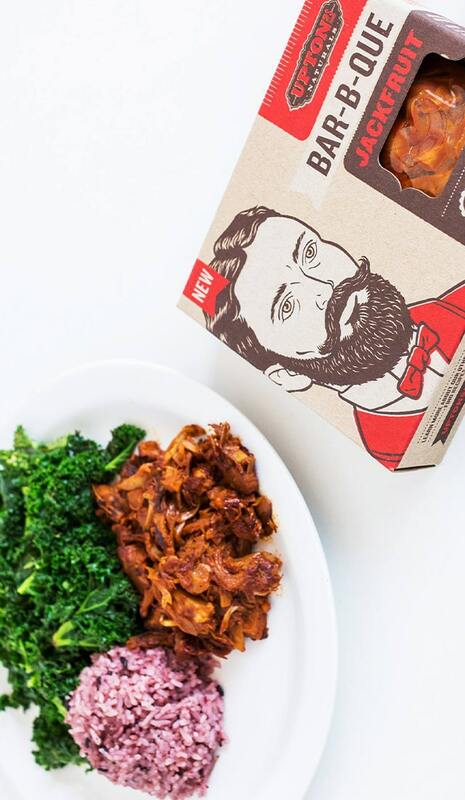 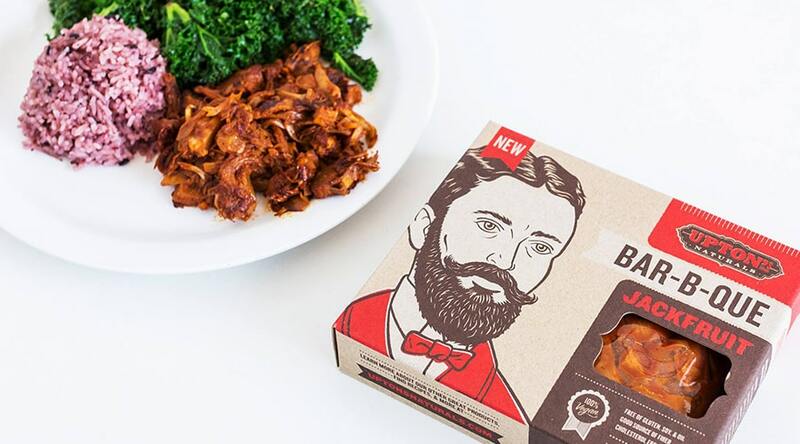 100% vegan and easy and quick to prepare, versatile use: lunch, snack, dinner or side dish, the meaty structure is similar to pulled pork, Upton’s Naturals does not have to be kept refrigerated. 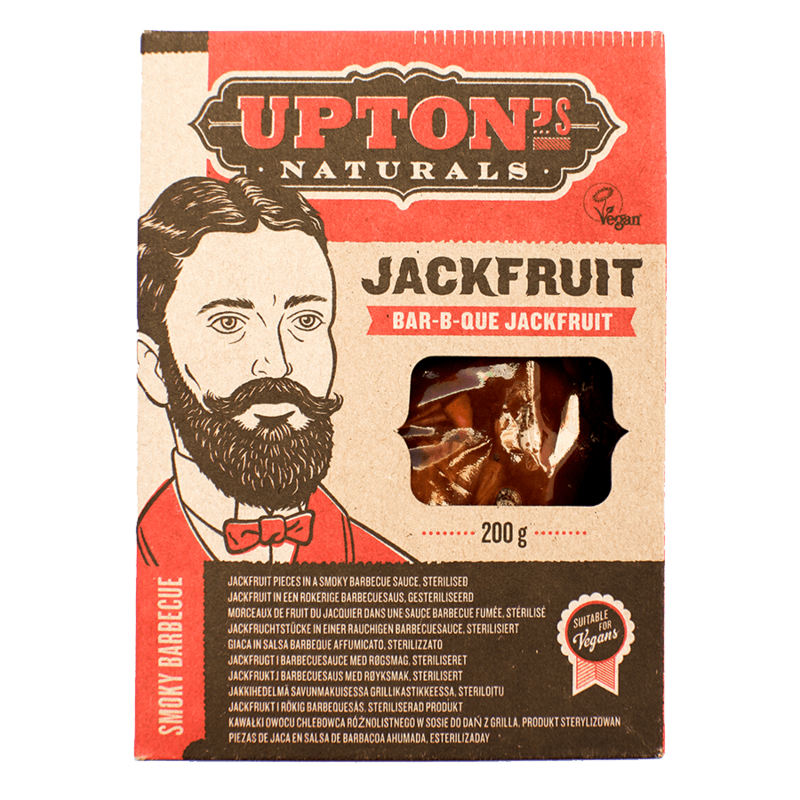 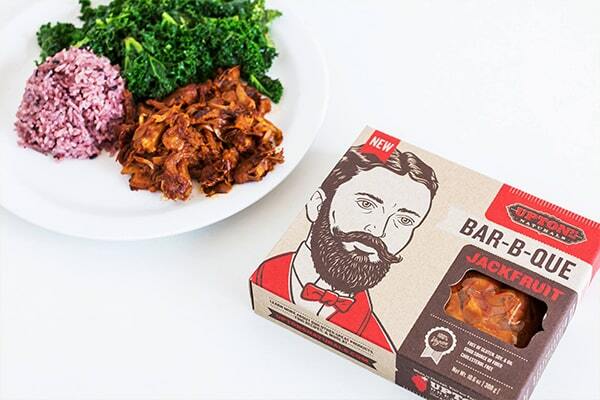 Upton’s Naturals is available in three delicious flavors (200g): Orginal Jackfruit, Thai Curry Jackfruit and Bar-b-que Jackfruit.